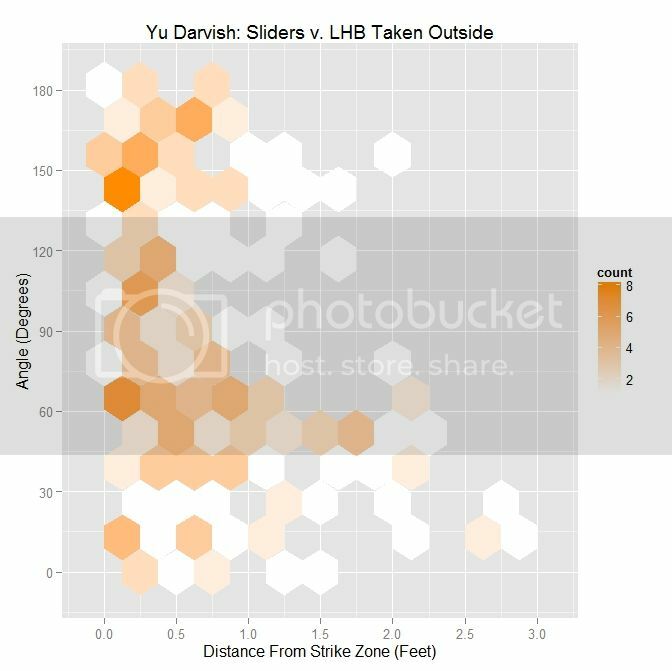 Last time, we analyzed Yu Darvish’s sliders in terms of when they projected as strikes and how pitch movement affected perception, leading batters to swing at pitches outside of the strike zone in the direction of the pitch movement. This time, we will turn our focus to four-seam fastballs. As before, we are using the 2013 data set since the algorithms for this were run before the completion of the 2014 season. 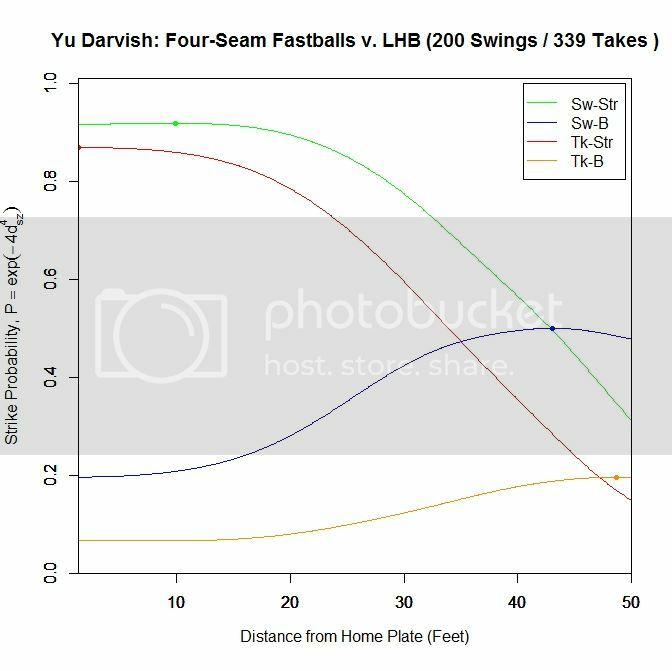 To start, we can examine a four-seam fastball from Yu Darvish, his second-most thrown type of pitch in 2013, via simulation using the nine-parameter PITCHf/x data for its trajectory. The chosen fastball from Darvish was thrown roughly down the middle of the strike zone and we also track the projection of the pitch as it approaches the plate. Note that the pitch, in this case, is simulated at one-quarter actual speed. The strike zone shown is the standard width of the plate and 1.5 to 3.5 feet vertically. The red circle represents the projection of the pitch after removing the remaining PITCHf/x definition of movement from its current location (Note that while the simulation shown above is a GIF, the actual simulation is an interactive PDF where the controls at the bottom of the image can play, rewind, slow down, etc. the simulation. This is discussed at the end of the article for the interested reader, including a link to several interactive PDFs as well as a tutorial for the controls and the source code written in TeX). Here, the movement causes the pitch to rise, giving the pitch in the simulation a “floating” quality as it never seems to drop. As in the previous work on sliders, we will start by splitting the four-seamers into four groups based on the pitch location and the batter’s response: strikes (pitches with a 50% chance or better of being called a strike) and balls (lower than 50% chance of being called a strike), and swings and pitches taken. Working with the projections to the front of the plate after removing the remaining movement on the pitch, we can examine how attractive (in terms of probability that the projection will be called a strike) pitches in each of these four categories, on average, are to batters incrementally as they approach the plate. For both types of pitches in the strike zone (red=taken, green=swung at), the average probability of the pitch being called a strike levels off around 20 feet, with strikes swung at peaking at probability 0.919 at 9.917 feet from home plate, then dropping to 0.917 at the plate. Strikes taken reach their maximum at the front of the plate with probability 0.869. The four-seamers swung at outside of the strike zone (blue) average around 0.5 probability of being called a strike up until around 30 feet, before dropping off. The fastballs taken outside the zone (orange) tend to project as low-probability strikes initially and remain so to the front of the plate. We can simplify this graph to include only swings and pitches taken. Once again, pitches swung at project as better pitches throughout than those taken. The peak for swings is at 14.083 feet with probability 0.782, and finishes at 0.777. 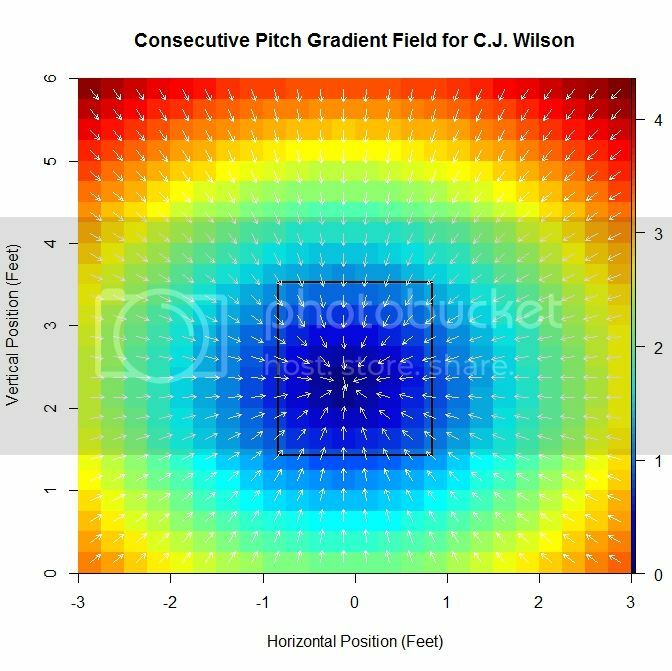 The pitches taken keep increasing in attractiveness all the way to the front of the plate, reaching a called-strike probability of 0.332. To further examine what is happening in these graphs, we can view the location of these projections from 50 feet to the front of home plate. The color scheme is the same as the four-curve plot above. Focusing on the blue projections for the moment (swings outside the strike zone), the projections down and to the right of the zone are carried by movement toward the strike zone and most end up as borderline strikes. Those up and to the left project further and further outside the strike zone as they approach the plate, since their direction of movement is roughly perpendicular to the strike zone contour. To get a better idea of the number of each of the four cases in nine regions in and around the strike zone, we can fade the data into the background and replace it in each region by an arrow indicating the direction that the average projection for that area is moving and the number of pitches of that case located there. Focusing first on the pitches in the strike zone, there is a dearth of projections in the upper-right area, which would be on the inside half of the plate to LHB. The pitches taken in the strike zone tend to skew slightly down and to the left, relative to those swung at. Note that in many of the regions around the strike zone, the samples are quite small so it may be difficult to draw any strong conclusions. With this in mind, these results can be summarized in the following table where the center cell represents the swing percentage in the strike zone and all other cells contain the percentage of swings in that region. The region with the highest swing percentage is the strike zone, at 59%. The region with the next highest percentage is above the strike zone, which is in the general direction of movement, but here there are only nine data points to rely on for this percentage. It would seem that the regions that induce swings are those where the pitches project in the strike zone and are carried out by movement (above and above-and-left of the zone) and where the pitches project as balls but movement is carrying them toward the zone (below and below-and-right of the zone). Notice that the area below and left of the strike zone has 47 pitches thrown there and only 2 swings, which is where the movement parallels the strike zone. It would appear, based on these observations, that the location of the pitch, relative to the direction of the movement, has an influence on generating swings outside the strike zone. 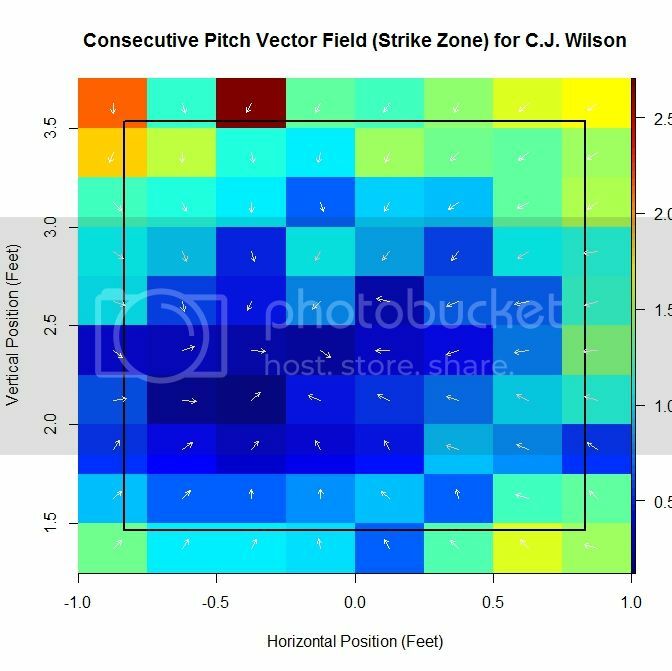 As with the sliders in the previous article, we will use, as a measure of if the pitch is thrown outside in the direction of movement, the angle between the movement of the four-seam fastballs at 40 feet (the pfx_x and pfx_z variables in the PITCHf/x data set) outside the zone and a vector perpendicular to the strike zone extending to the final location of the pitch at the front of home plate. An angle of zero indicates that the movement of the pitch carried it perpendicularly away from the strike zone. Ninety degrees means that the pitch projection parallels the strike zone due to movement. A one-eighty degree angle means that the pitch is being carried by movement perpendicularly toward the strike zone. Further explanation, including a visual depiction, can be found in the link to the previous article at the top of this page. 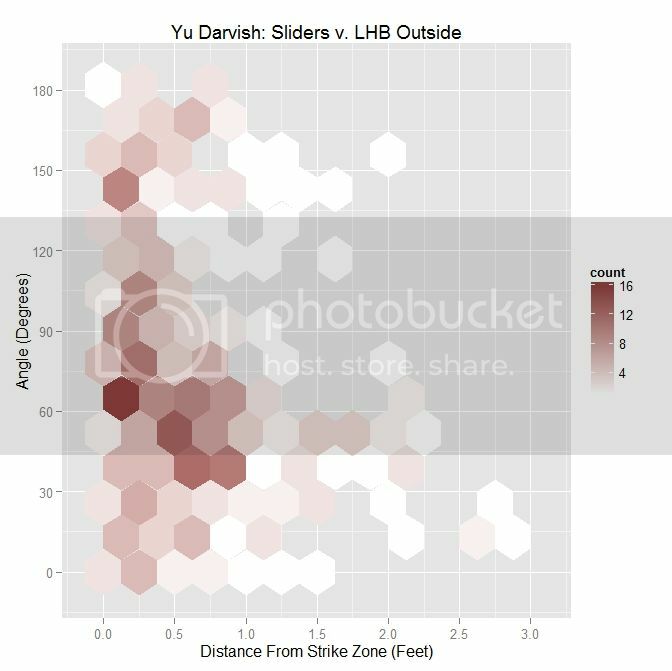 To begin, we will look at the distribution of angle versus distance from the strike zone for all of Darvish’s four-seamers outside the zone to lefties. 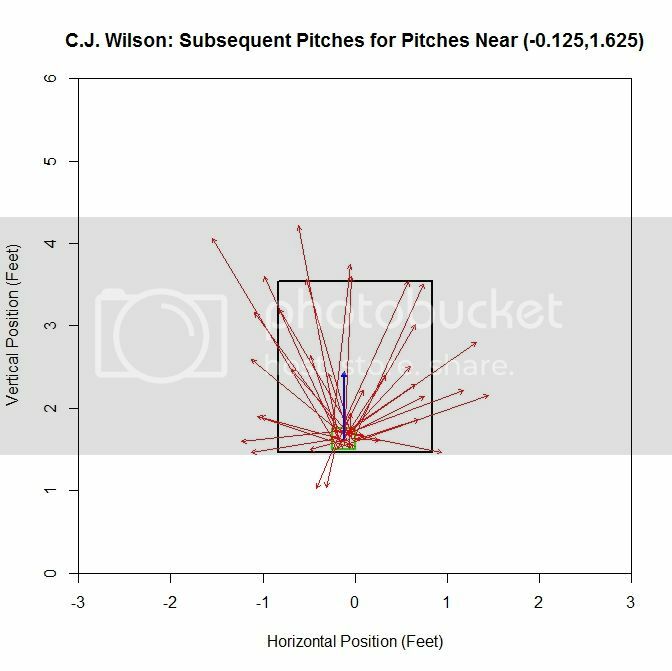 The distribution, in this case, seems slightly skewed toward having pitches thrown in the general direction of movement. This visual assessment is supported by the percentages in the table (sorted by angle and average distance from the strike zone contour in feet. 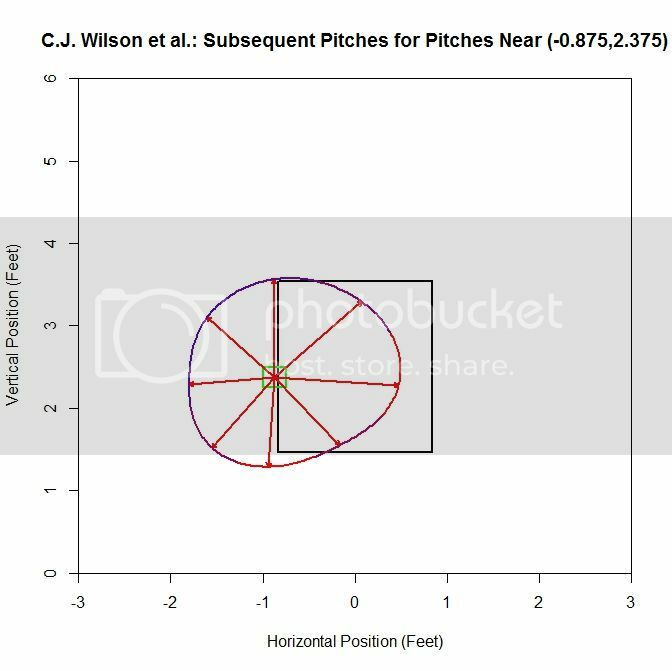 e.g., 0.5 = 6 inches, 0.33 = 4 inches), with nearly 29% of pitches having an angle of less than 45 degrees and over 58% with an angle less than 90 degrees. The distribution does not seem to have definitive shape. 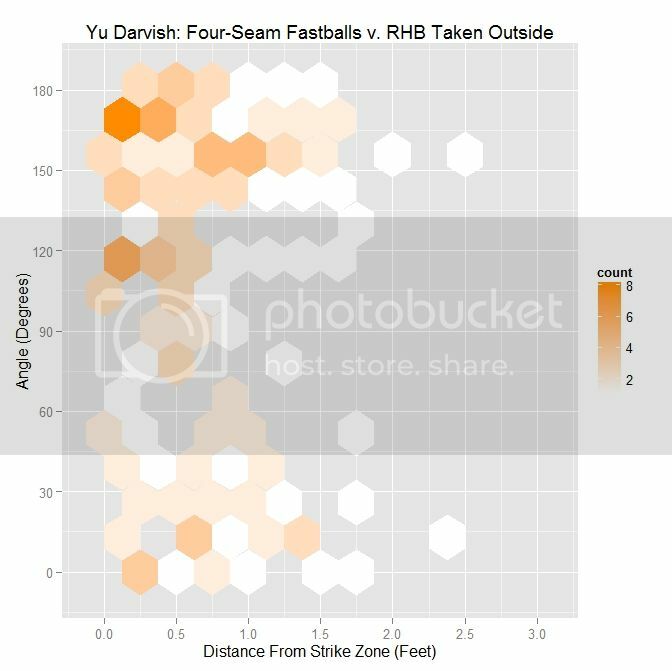 For all MLB right-handed pitchers in 2013, including Darvish, the distribution is much more clear. There is a swell of pitches thrown with angle between 0 and 90 degrees and within six inches of the strike zone, with 37.5% thrown with an angle of less than 45 degrees, and 61.9% with an acute angle. In conjunction, as the angle increases, the average distance from the strike zone decreases. To get a better handle on the ramifications of this choice of pitch locations, we can further sort the data into swings and pitches taken. For MLB righties, the largest area of swings is right around a 30-degree angle. Close to half of the swings, 46.9% to be exact, occur when the angle is less than 45 degree and over two-thirds are for pitches in the general direction of movement. 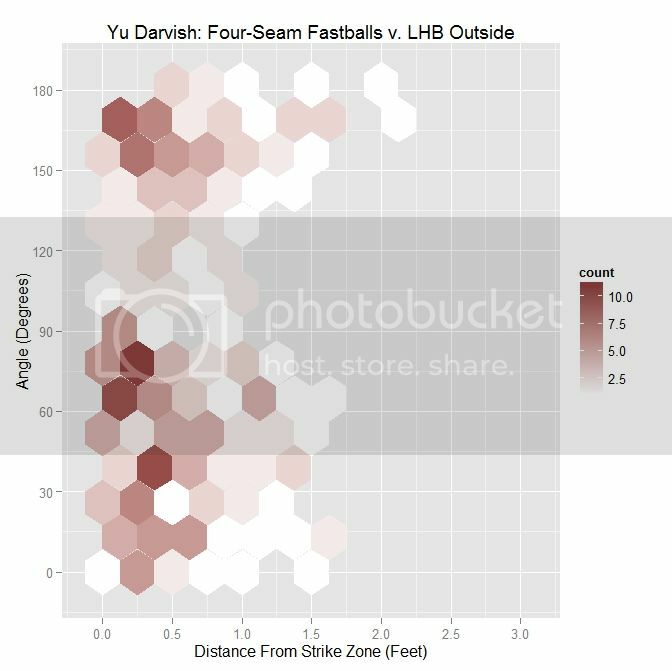 The average distance on four-seamers swung at outside is close to Darvish’s overall, but is almost an inch further out for Darvish for 45-degree or less angles. 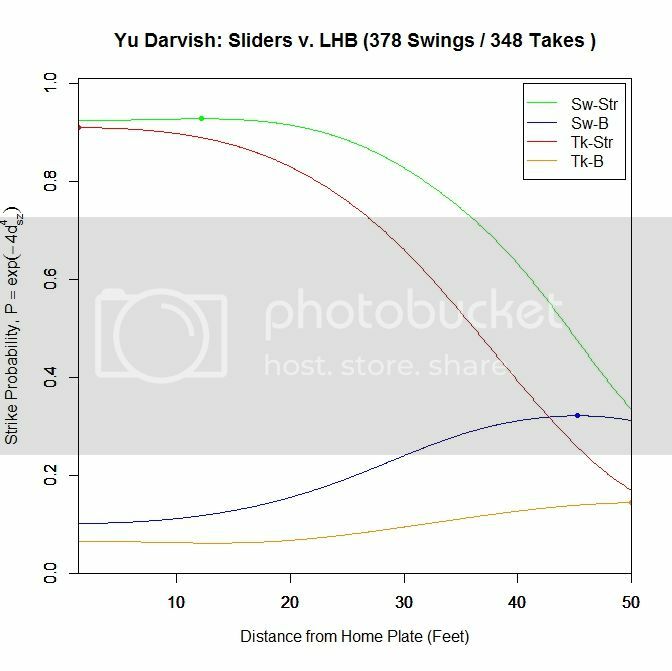 So for RHP to LHB, pitches thrown in the neighborhood of 30 degrees and within a half-foot of the strike zone tend to induce swings, which is also seen for Darvish. 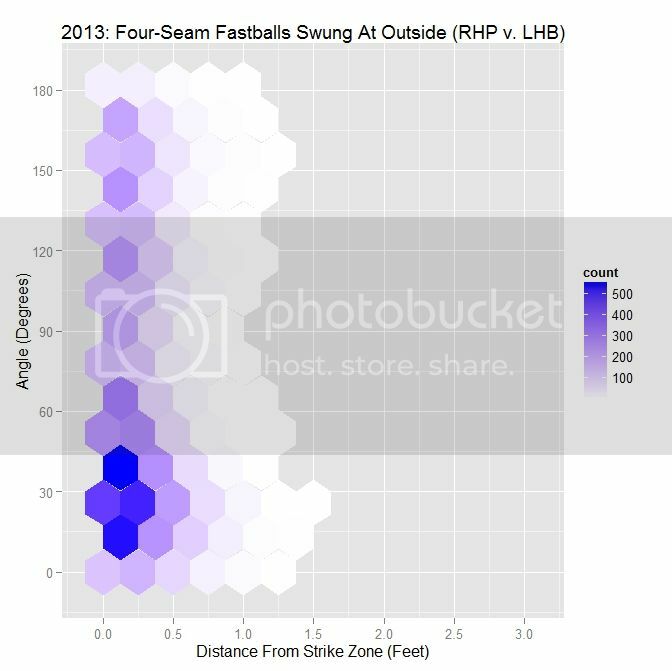 We can now look at the complement of this, pitches taken outside, to see how this distribution compares to swings. 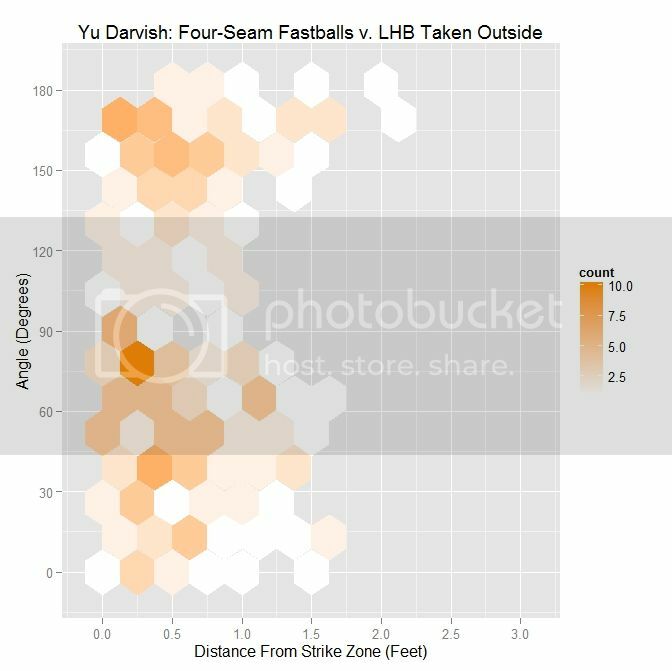 The distribution for Darvish on pitches taken has some semblance to that for all pitches, but the percentages have dropped in all cases. In addition, the average distances across the board are over six inches outside. For all MLB RHP in 2013, the pitches taken by LHB outside the strike zone are largely located below 90 degrees, with a large number near 60 degrees. Compared to the case of all pitches outside the strike zone, the percentages are not all that dissimilar, but the distances are slightly larger. Putting the two hexplots together to see how they form the plot for all outside pitches, we see that what appears to be one large grouping of data below 90 degrees for all pitches separates into two smaller groupings: one around 30 degrees for swings and one around 60 degrees for pitches taken. To examine why it might be the case that pitches thrown in the direction of movement, meaning a small angle between the movement vector and the vector perpendicular to the strike zone, are swung at more frequently and are more effective at inducing swings further from the strike zone than those that are not, we can take a four-seamer thrown by Darvish above the strike zone and examine both the trajectory of the pitch and its projection. 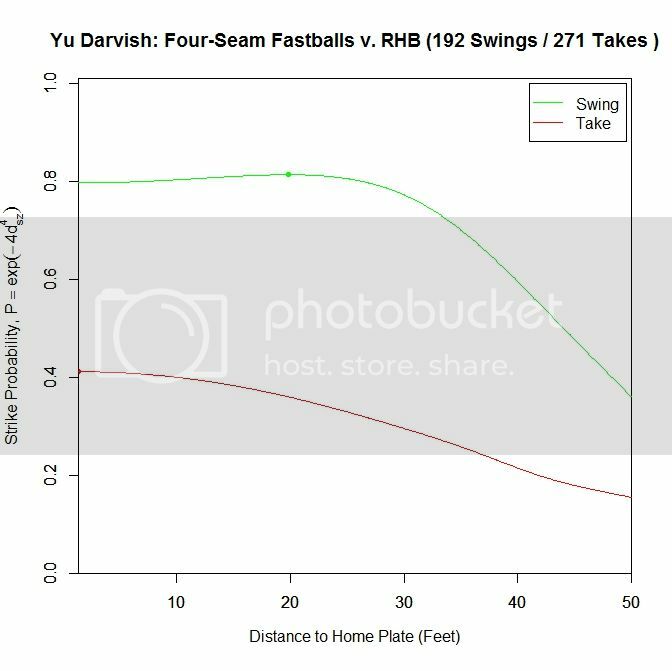 We can again simulate such a pitch (at quarter speed) via the PITCHf/x data for Darvish. 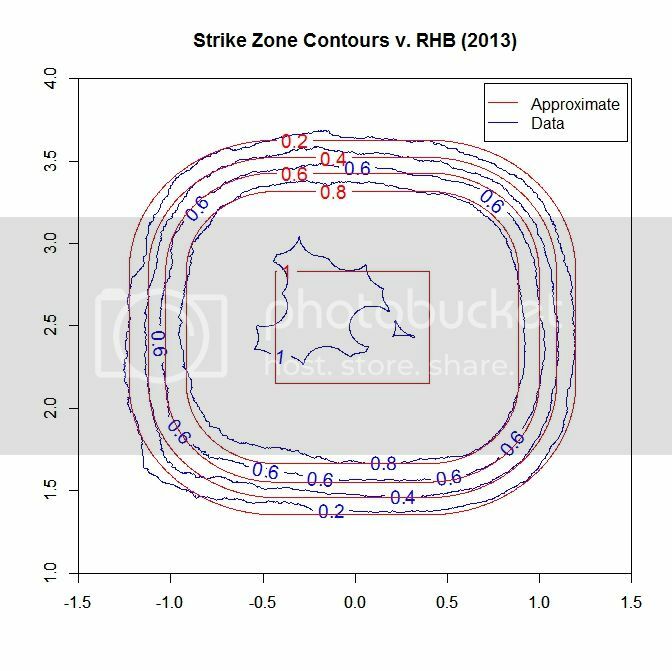 Note that since the below simulation does not possess the same computational capabilities as the rest of the code, which is done in R, we use the standard strike zone as a reference rather than the 50% contour. Based on the simulation and associated projection, we can see that the pitch projects as a strike early on and, late in its trajectory, appears to be a ball. 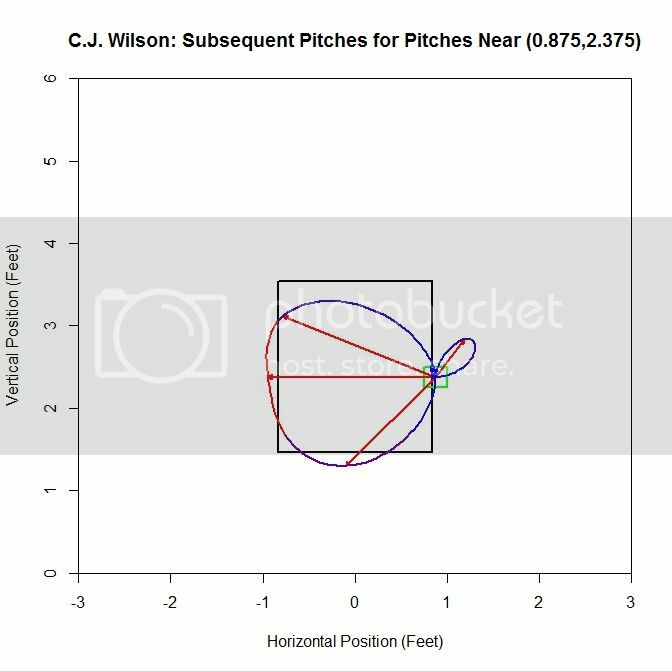 The important observation for this is that, for some part of its flight, the pitch does appear that it may be a strike. Similarly, for a pitch below the strike zone, we see the opposite result. One can see the problem with getting a batter to swing at a pitch such as this. It starts out as looking like a pitch in the dirt and, through its path to the plate, only slightly improves its chances of being called a strike, and at no point really gives the batter much incentive to swing at it. Thus it makes sense that a batter might swing at a four-seam fastball high above the strike zone but not one a similar distance beneath. 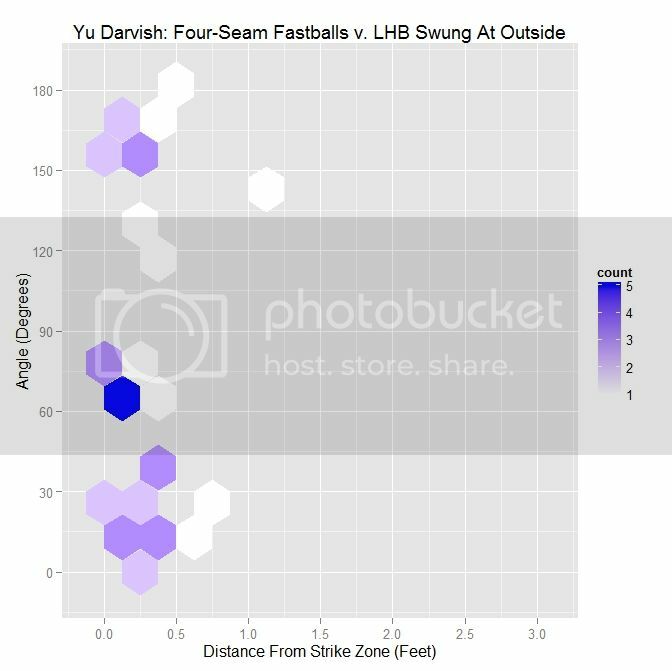 Performing the same analysis for right-handed batters, we again start with Darvish’s results for the four-seam fastball in terms of ball/strike and swing/take. Here, the swing/strike curve peaks at probability 0.94 at 11.667 feet and finishes at 0.937. These probabilities are slightly higher than those for lefties at the maximum and at the front of the plate. 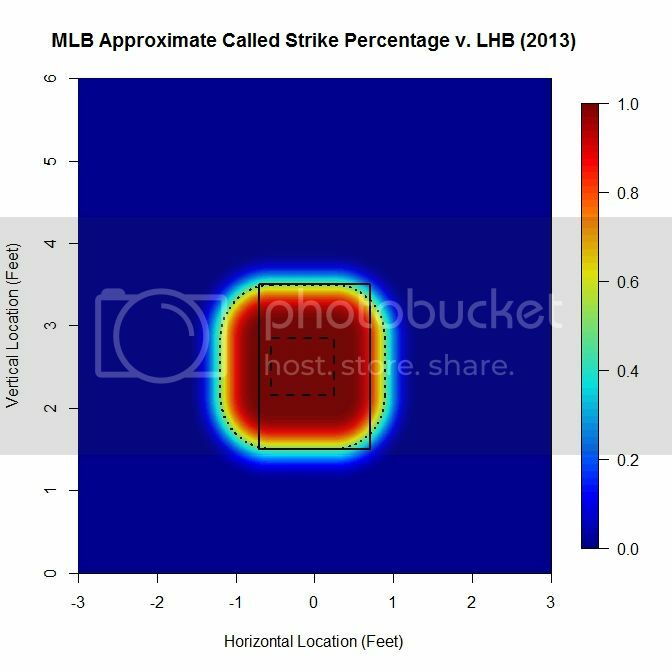 The pitches taken in the strike zone peak at the plate with probability 0.904, compared to 0.869 for LHB. For both cases of pitches outside the strike zone, they reach their maximum very early in the trajectory and drop off afterward. Changing to the two-curve representation for four-seam fastballs to right-handers, the swing curve reaches its apex of probability 0.814 at 19.833 feet and ends with probability 0.797 at the plate. For pitches taken, the average strike probability increases throughout the trajectory, ending at 0.411. Once again, these probabilities are higher than for left-handed batters. As before, we can switch to the discrete data and their projections as the pitches near the front of home plate. 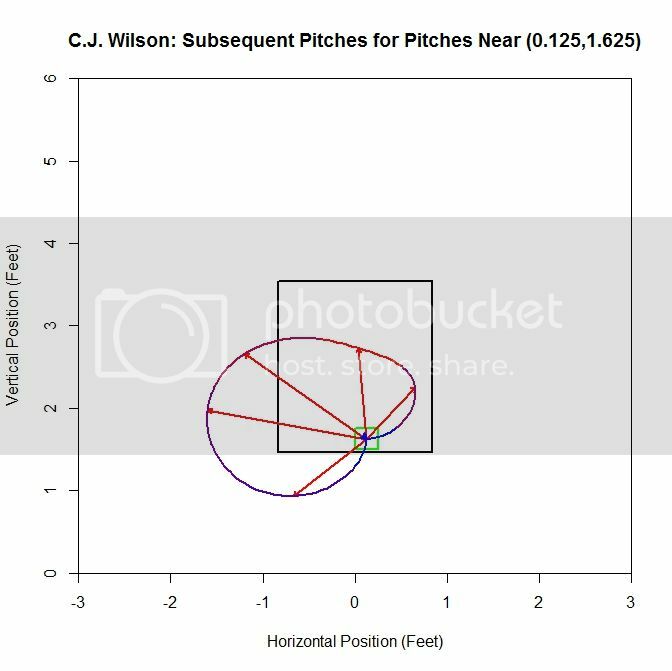 Of note is that the pitches taken (red data points) are, by and large, down and to the right of the strike zone from the catcher’s perspective, which is in the opposite direction that the movement influences the pitches as they approach the plate. In addition, the majority of swings outside the strike zone, the blue data points, leave the strike zone in the direction of movement. Also of interest is that the pitches fill up the strike zone more against RHB, while four-seamers to LHB were lacking for the inner half of the strike zone. 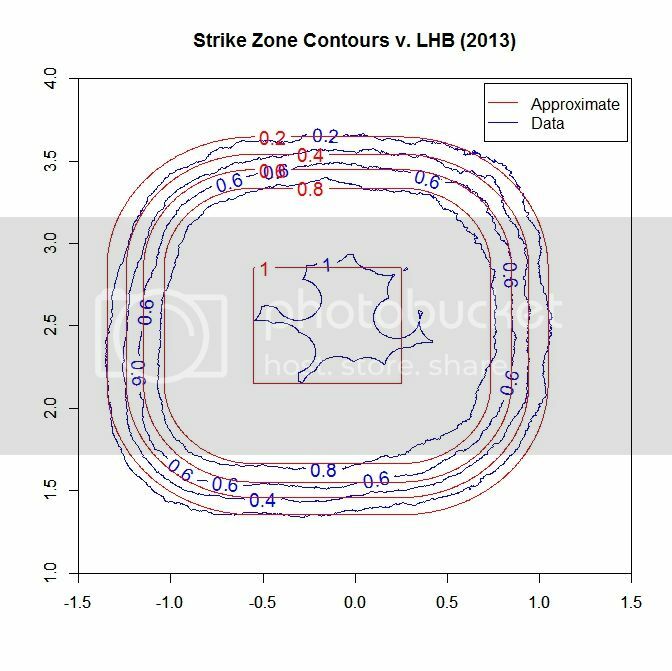 For the pitches swung at outside the strike zone in the opposite the direction of movement, down and to the right, they end up very close the strike zone contour, making them boarderline strikes, and thus nominally classified outside the zone. To observe these phenomena more succinctly, we can switch to a vector representation indicating the number of pitches and the direction that the projections are headed for each of the nine regions in and around the strike zone. Of the 270 pitches in the defined strike zone, the average location of the 112 taken were down and to the right of those swung at, as represented by the red and green arrows. To quantify the percentage of swings in each of the nine regions, we can refer to the below table, aligned spatially with the data from the GIF (center square being in the strike zone). Based on these results and for regions with more than a handful of pitches, the highest percentages of swings outside the strike zone are in the upper and upper-left regions, in the direction of movement. The lower-left corner is large as well but can be disregarded as it only contains two pitches, one of which was swung at. Also, it is hard to draw any conclusions to the left of the plate since there is no data. 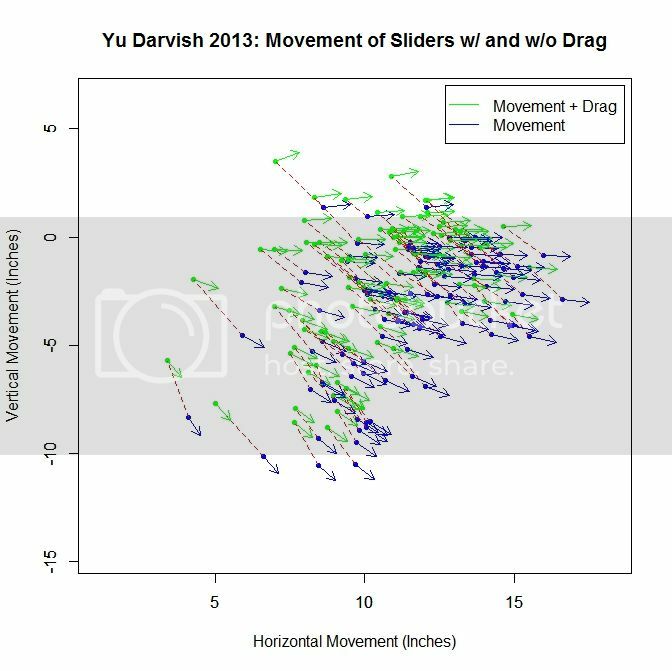 First, for Darvish, the distribution of pitches, when viewed by plotting distance from the strike zone versus angle between the perpendicular vector to the strike zone and the movement vector, appears bimodal with a large grouping both above and below the 90-degree mark. The four-seamers outside to righties are, on average, over 6 inches outside, with most thrown, 59.9% to be precise, in the opposite direction of movement. 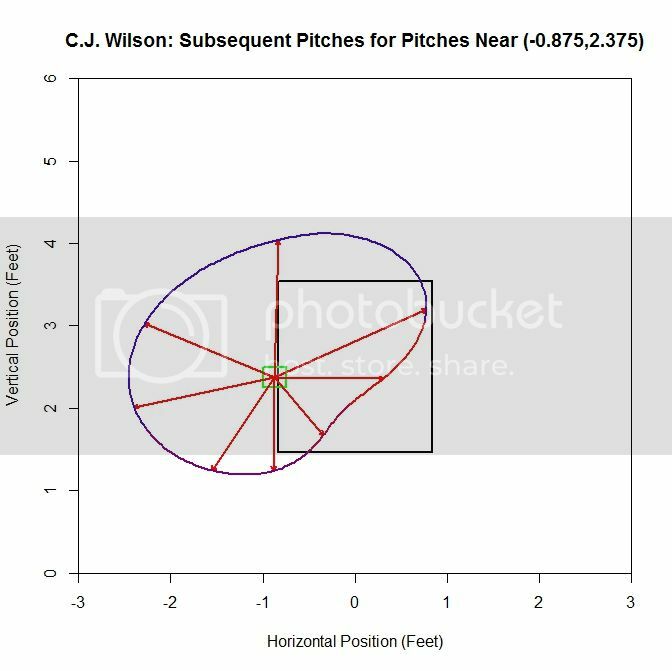 However, most of the pitches thrown in the direction of movement, 31.2%, are thrown with an angle of less than 45 degrees. Compared to LHB, the distances are greater and the percentage of pitches with an angle of less than 90 degrees is noticeably lower. For MLB RHP, the distribution also appears bimodal, with two groupings of data near 30 degrees and 120 degrees. 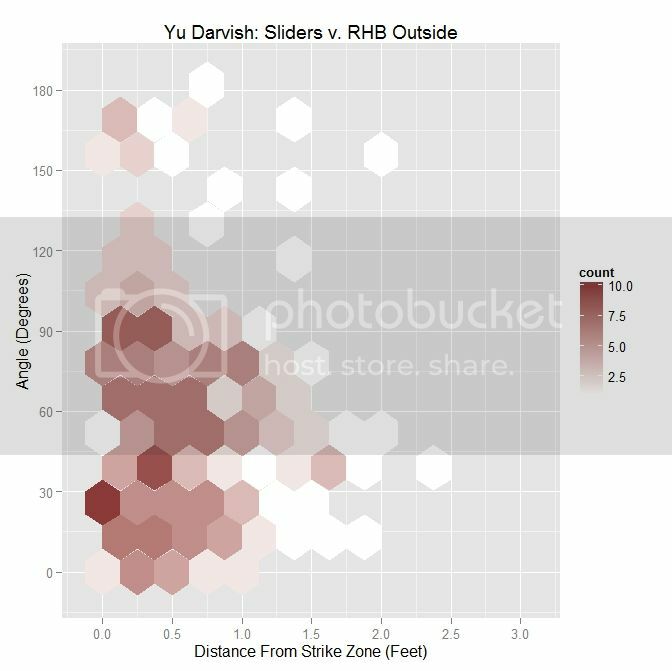 This roughly mirrors Darvish’s distribution, relative to angle versus distance. 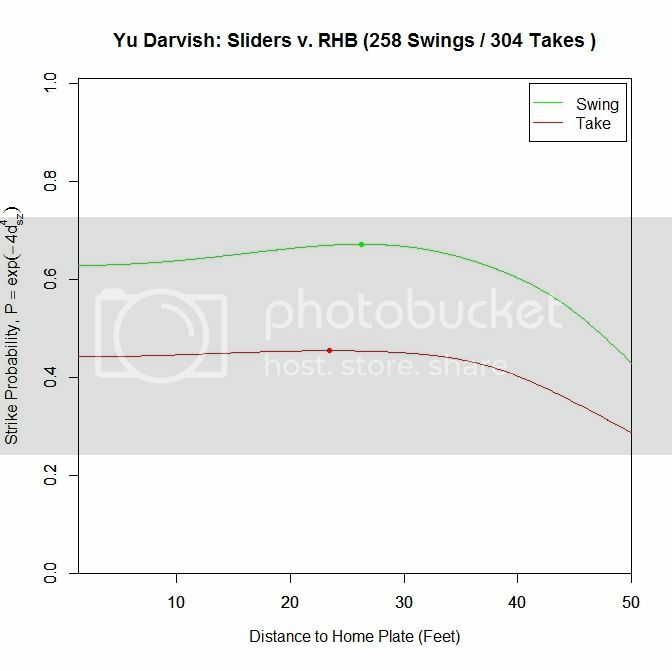 As compared to Darvish, RHP threw about the same percentage of pitches with an angle of less than 45%, but more with an angle of less than 90 degrees. In all cases, the MLB RHP four-seamers outside were, on average, closer to the strike zone. Compared to pitches outside to lefties, the percentages for less than 45 and less than 90 degrees are down. 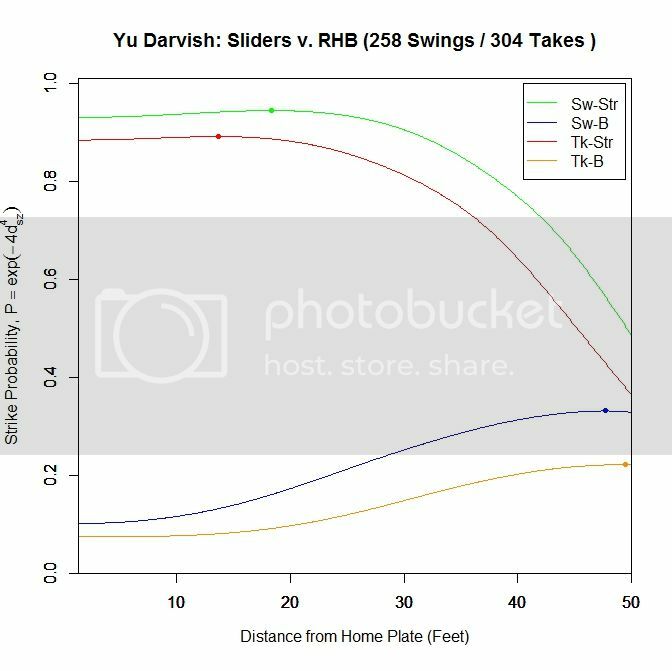 Taking the subset of pitches swung at outside for Darvish, the distribution has become closer to having a single mode near 30 degrees. Despite reaching into small sample sizes for this subset, the below table reinforces these conclusions. 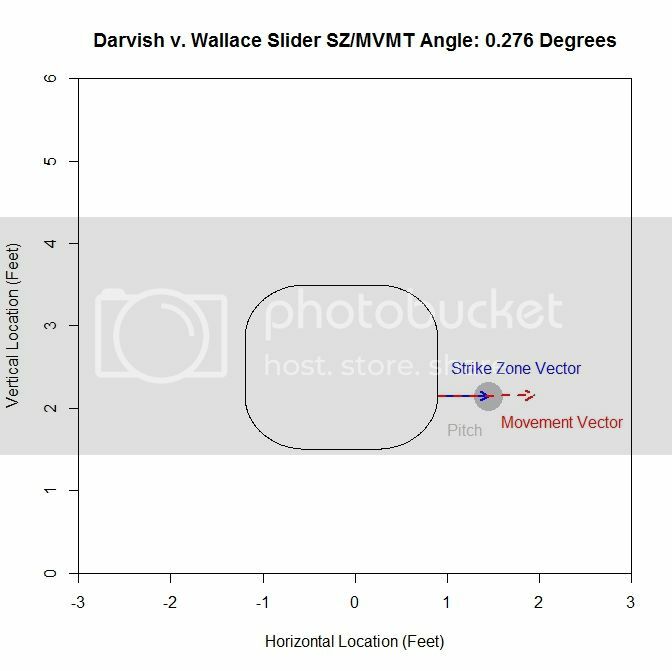 While only around 30% of Darvish’s pitches were thrown with an angle of 45 degrees or less, over two-thirds of his swings outside the strike zone were in this range of angles. This increases to nearly 75% when considering four-seam fastballs thrown in the general direction of movement, meaning 90 degrees or less. Of note here is that the distance that entices a swing decreases as the movement aligns less and less with the vector perpendicular to the strike zone. 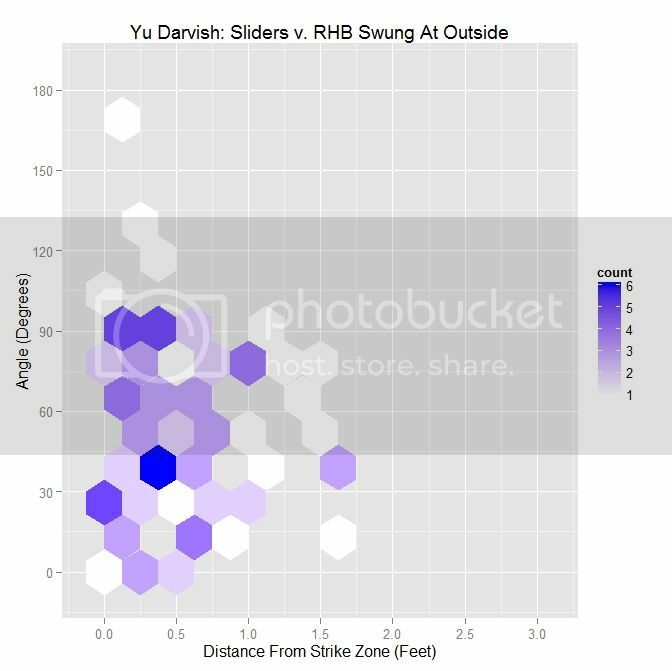 Here, the distances are greater compared to left-handed batters faced by Darvish in 2013, but the percentages are up. Switching the larger sample of all 2013 MLB RHP, we retain only one of the modes observed for all pitches. 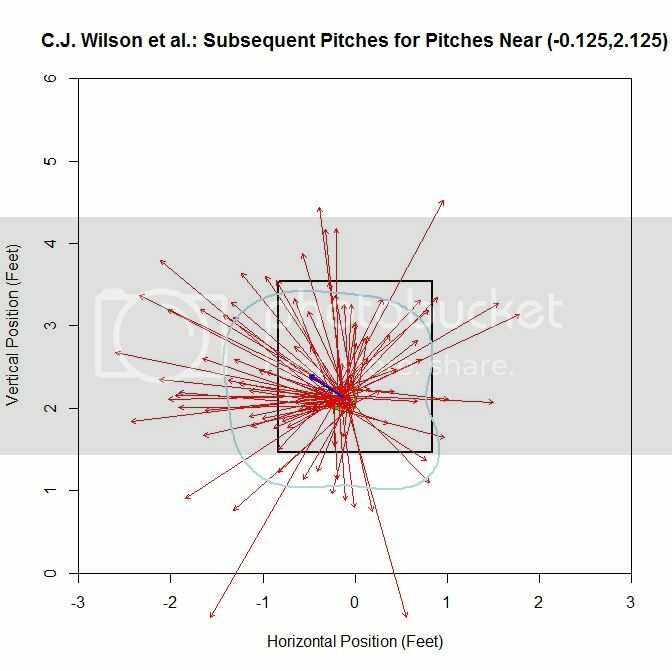 The pitches that are swung at outside are clustered down near 15 degrees and within half a foot of the strike zone. The percentage of swings with an angle of 45 degrees or less is over 50% and, like Darvish, those less than 90 degrees are up near 75%. 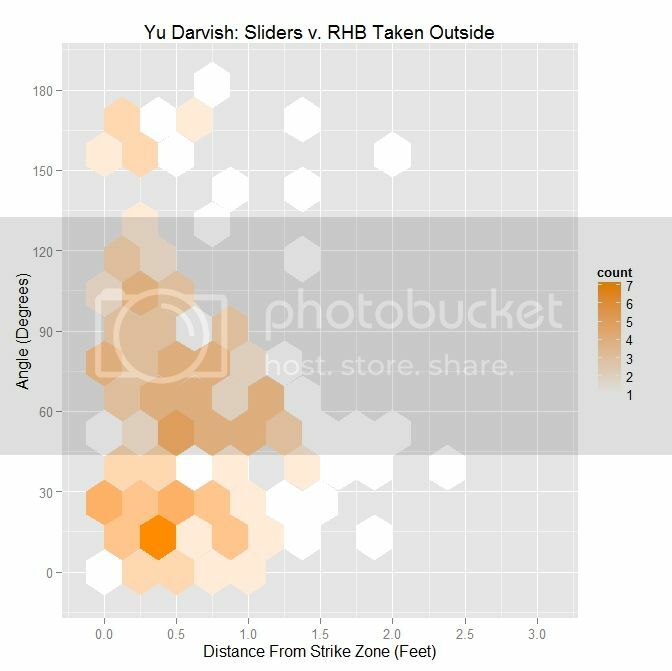 The distance again decreases as the angle increases and, compared to Darvish, is much closer to the zone. Versus right-handed batters, the percentages for angles 45 and 90 degrees or less are greater but the distances do not differ greatly as compared to LHB. The other half of the data, pitches taken outside, gives us the second mode seen originally in Darvish’s data. This mode is a cluster of data above the 90 degree level. 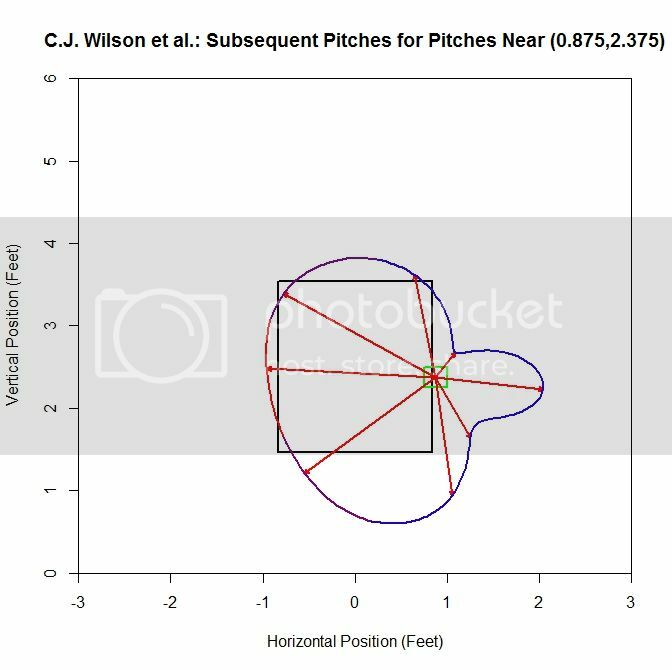 While a quarter of the pitches taken are thrown with an angle of 45 degrees, only a little over one-third were thrown in the general direction of movement. Note that the pitches that are thrown in the direction of movement and are taken tend to average three-quarters of a foot outside, so it makes sense that they would not be swung at. The percentage of pitches taken with an angle of less than 90 degrees is down from 56.8% for LHB and, overall, the pitches are almost an inch further outside. For the MLB data set, the second mode is located around 120 degrees. 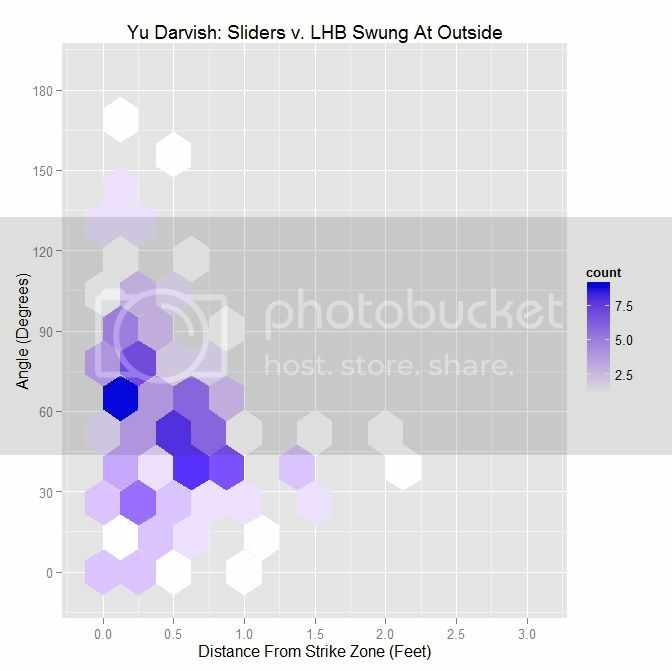 As with Darvish, about one quarter of the pitches taken outside are at an angle of 45 degrees or less and 59% are thrown in the opposite direction of movement. When put up against the pitches taken by LHB, the percentages are down for both 45 and 90 degree or less pitches from 35.1% and 60.7%, respectively. As with RHP versus LHB, the full distribution, in terms of the hexplots, separates into two clusters: one related to swings and one related to pitches taken. The cluster related to swings sits in the range of 15 degrees while pitches taken are closer to 120 degrees. This is similar to the case for lefties, except the cluster of pitches taken moves from the 60-degree area to the 120-degree area and the cluster related to swings moves down from 30 degrees to 15 degrees. However, in both cases, the swings appear to be separate clusters from the pitches taken. 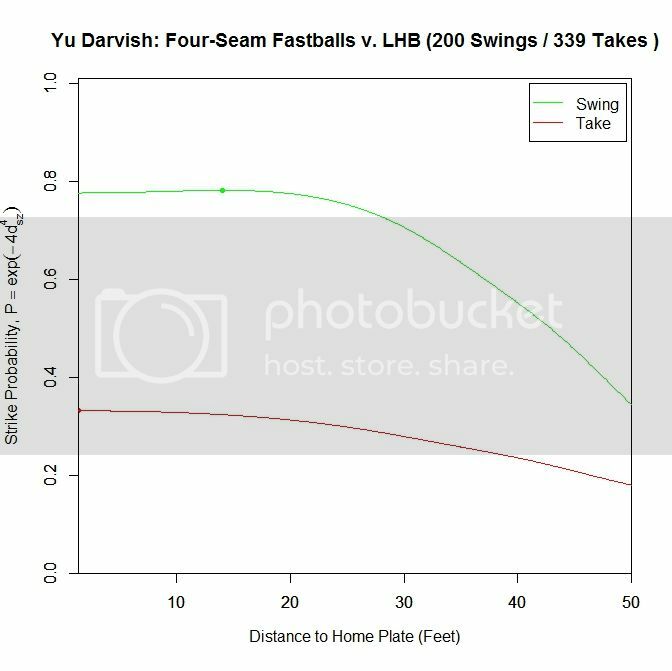 For four-seam fastballs thrown by Yu Darvish in 2013, the maximum attractiveness on swings is in the range of 10-20 feet in front of home plate for left- and right-handed batters, possibly tying into how long a batter can reasonably project a pitch when deciding to swing. The four-seamers also tend to be swung at outside the strike zone in the general direction of movement, which we have seen previously with sliders. This is especially pronounced for RHB vs RHP, with pitches exiting the strike zone in the direction of movement causing swings, and pitches entering the zone opposite the direct of movement being taken. By simulating the PITCHf/x data, we can get an idea of why this might be true: pitches outside thrown in the general direction of movement project in the strike zone for some period of time before projecting outside of it and pitches thrown opposite this direction project outside and, while their probability increases, these pitches never appear as strikes and thus do not usually induce swings from the batter. 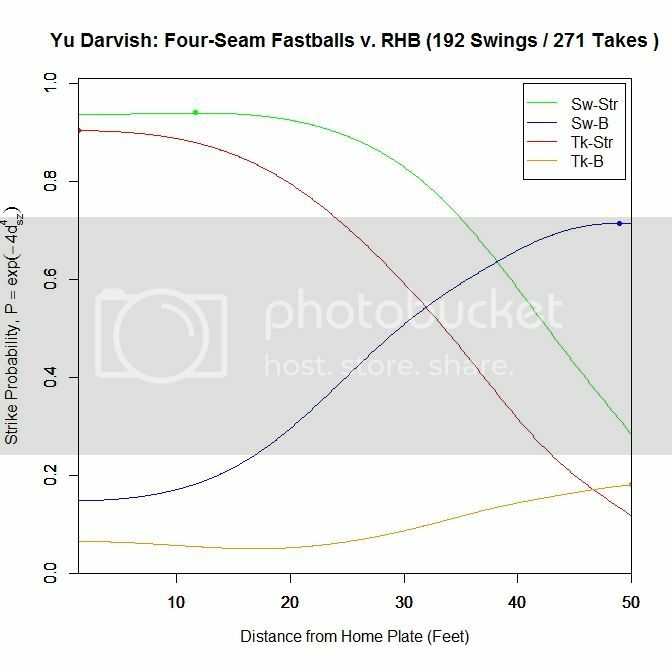 Next time, we will finish up with cut fastballs from Yu Darvish and see how movement affects perception in this case. After that, we can switch to the 2014 data set and also turn the algorithm around and apply it to a batter. In order to make the GIFs for simulating the PITCHf/x data, we are first using TeX to write the code and then compiling it using MiKTeX with the “animate” package handling the controls. To begin, we place a reference point 6 feet, 1 inch behind the tip of home plate, roughly approximating the location of the catcher (the one inch past six feet is not important but makes the distance to the front of home plate an even 7.5 feet). The height of the reference point is taken to be 2.5 feet in the z-direction. This is the point by which we will determine perspective. Everything will be projected into the plane at the front of home plate, spanning three feet to the left and right of center and from the ground to five feet high. For a given position of the pitch, we find the associated spherical coordinates, relative to the reference point. To figure out where to display the pitch in the frame, we track the pitch along the line formed between the pitch location and the reference point until it reaches the frame. Since the two angle measures of the spherical coordinates will not change when tracking along this line, we need only find the distance along it that places it in the frame we are displaying. Once we have the location of the pitch in the frame, we still need to find the size of the pitch as seen from that distance. To do this, we again use the reference point and find the distance to the center and to the top of the baseball. With a third side that goes from the top to the center of the baseball, this creates a triangle. Forming a similar triangle by adding an additional third side where the frame cuts the triangle at the front of the plate, we obtain a smaller triangle contained in the larger one. Using this geometry, we can find the size that the pitch will appear at this distance using trigonometric properties of similar triangles (namely that their sides have the same ratio). To begin the simulaton, we find the times associated with 55 feet and the front of the plate. We then find the location of the pitch in three dimensions, incrementing in time from release to strike zone and adjusting the location and the size of the pitch to appear positioned and scaled correctly in frame. The simulation in the actual PDF is at 60 frames per second, with most animations lasting around a half a second. For the purposes of creating GIFs, we slow the pitches down to one quarter this speed and capture using a program called LICEcap. The code is written so as to work for any pitch by merely swapping in the chosen 9-parameter PITCHf/x data and recompiling. The projection is shown as a red circle, and is calculated as previously discussed. All background features are scaled appropriately, in a similar manner as the pitch. Note that while this is, in many ways, an approximation of perception from the catcher’s point of view, it functions well for our purposes of providing a decent replacement for live video since we can overlay the projection and view it from the reverse of the traditional television angle from center field. Included is a link to a Google Drive containing a collection of interactive PDFs for pitchers and pitches from 2013 and 2014. There is also an interactive guide to the controls with the given example being a Clayton Kershaw slider. Finally, the source code is included so the interested reader/programmer can input any chosen PITCHf/x parameters and compile to get a representation of the pitch, that includes distance to home plate, the velocity of the pitch, and the time since release. Pitch sequencing is a complicated topic of study. Given the previous pitch(es) to a batter, the next pitch may depend on factors such as the game-based information (e.g., count, number of outs, runners on base); the previous pitch(es), including their location, type, and batter’s response to them; and the scouting report against the batter as well as the repertoire of the pitcher. In order to approach pitch sequencing from an analytical prospective, we need to first simplify the problem. This may involve making several assumptions or just choosing a single dimension of the problem to work from. We will do the latter and focus only on the location of pitches at the front of the strike zone. Since we are interested in pitch sequencing, we will consider at-bats where at least two pitches were thrown to a given batter. 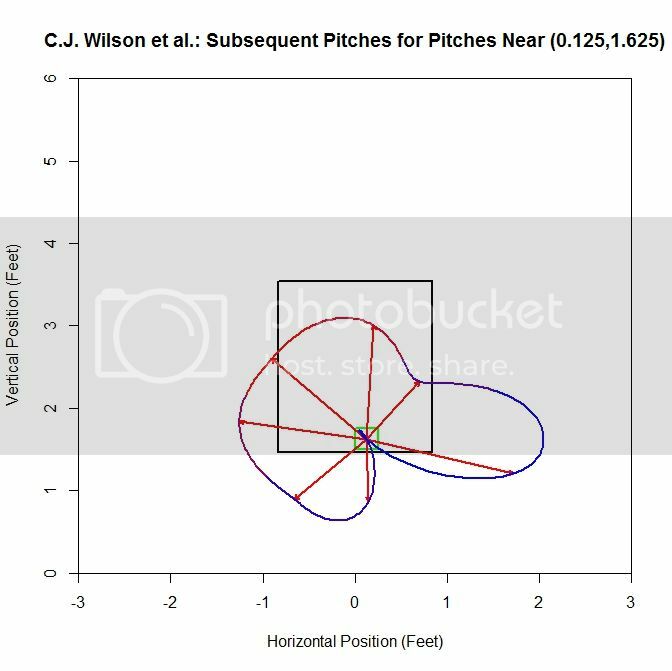 The idea is to use this information to generate a simple model to indicate, given the previous pitch, where the next pitch might be located. We can start with examining the distance between pitches, regardless of the location of the initial pitch. If this data, for a given pitcher, is plotted in a histogram, the spread of the data appears similar to a gamma distribution. Such a distribution can be characterized many ways, but for our purposes, we will use the version which utilizes parameters k and theta, where k is the shape parameter and theta is the scale parameter. With a collection of distances between pitches in hand, we can fit the data to a gamma distribution and estimate the values of k and theta. As an example, we have the histogram of C.J. 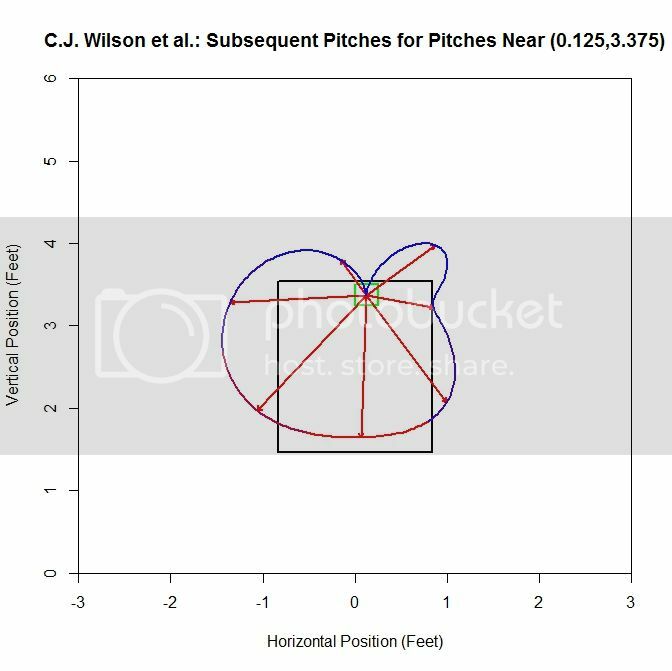 Wilson’s distances between pitches within an at-bat from 2012 overlaid with the gamma distribution where the values of k and theta are chosen via maximum likelihood estimation. Author’s note: I started working on this quite a few weeks ago and so, at the time, the last complete set of data available was 2012. So rather than redo all of the calculations and adjust the text, I decided to keep it as-is since the specific data set is not of great importance in explaining the method. I will include the 2013 data in certain areas, denoted by italics. While this works for the data set as a whole, this distribution will not be too useful for estimating the location of a subsequent pitch, given an initial pitch. One might expect that for pitches in the middle of the strike zone, the distribution would be different than for pitches outside the strike zone. To take this into account, we can move from a one-dimensional model to a two-dimensional one. Also, instead of using pitch distance, we are going to use average pitch location, since this will include directional information as well. To start, we will divide the area at the front of the strike zone into a grid of three-inch by three-inch squares. We choose this discretization because the diameter of a baseball is approximately three inches and therefore seems to be a reasonable reference length. The domain we consider will be from the ground (zero feet) to six feet high, and three feet to the left and right of the center of home plate (from the catcher’s perspective). We will refer to pairs of sequential pitches as the “first pitch” and the “second pitch”. The first pitch is one which has a pitch following it in a single at-bat. This serves as a reference point for the subsequent pitch, labeled as the “second pitch”. Adopting this terminology, we find all first pitches and assign them to the three-inch by three-inch square which they fall in on the grid. Then for each square, we take its first pitches and find the vector between them and their associated second pitches (each vector points from the first pitch to the second pitch). We then average the components of the vectors in each square to provide a general idea of where the next pitch in headed for the first pitches in that square. 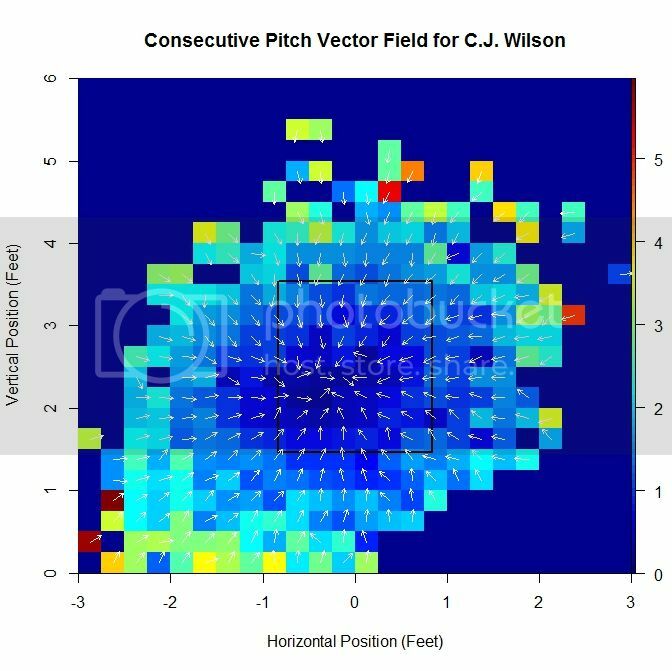 As opposed to the previous case, there is a distinct pattern of pitches up from the position (-0.125,1.625), which is shown by the average vector having a substantially larger magnitude. This is due to most of the vectors having a large positive vertical component. Running over the entire grid where at least one pitch had a pitch following it, we can generate a series of these average vectors, which make up a vector field. In order to make the vector field plot more legible, we remove the component of magnitude from the vector, normalizing them all to a standard length, and instead assign the length of the vector to a heat map which covers each grid square. P(x,z) = (1/2)c_x(x – x_0)^2 + (1/2)c_z(z – z_0)^2. grad(P) = [c_x(x – x_0), c_z(z – z_0)]. The gradient field is fit to the average vectors using linear least squares minimization for the x- and z-components. This produces estimates for c_x, c_z, x_0, and z_0. For the original vector field, if we are interested in the location where the average vector is smallest in magnitude (or the location where there is the least bias in terms of direction of the next pitch), we are limited by the fact that we are using a discretized domain and therefore can only have a minimum location at a small, finite number of points. One advantage to this method is that it produces a minimum that comes from a continuous domain and so we will be able to get unique minimums for different pitchers. Another piece of information that can be gleaned from this approximation is the constants, c_x and c_z. 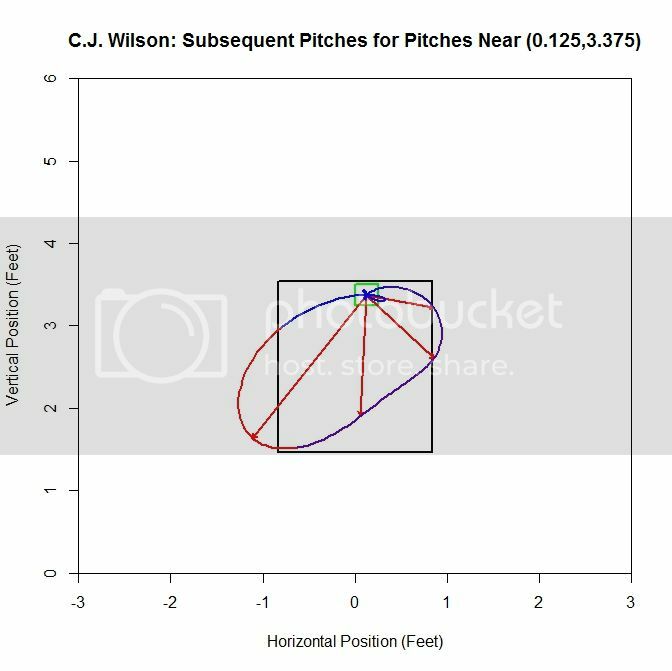 If c_x is large in magnitude, there may be a large east-west dynamic to the pitcher’s subsequent pitch locations. For example, if a first pitch is in the left half of the strike zone, the next pitch may have a proclivity to be in the right half and vice versa. A similar statement can be made about c_z and north-south dynamics. Alternatively, if c_x is small in magnitude, then less information is available about the direction the next pitch will be headed. For Wilson, the constants obtained from the best fit approximation are a pitching sink of (-0.163,2.243) and scaling constants (-0.925,-1.055). For C.J. Wilson’s 2013 season, we have the sink at (-0.109,2.307) and scaling constants (-0.902,-0.961), so the values are relatively close between these two seasons. We can now obtain this set of parameters for a large collection of pitchers. For each pitcher, we can find the vector field based on the data and then find the associated gradient field approximation. We can then extract the scaling constants and the pitching sink. 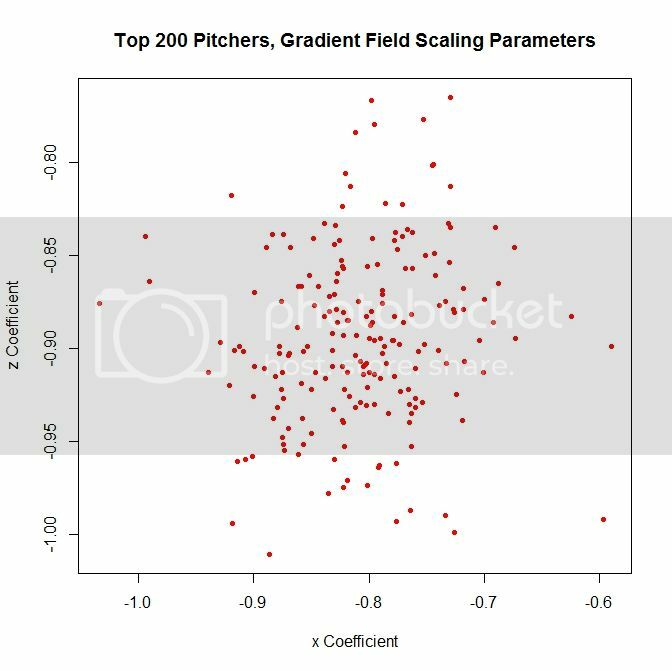 We can run this on the most recent complete season (2012, at the start of this research) for the 200 pitchers who threw the most pitches that year and look at the distribution of these parameters. The scaling constants are distributed around a region of -1 to -0.8 vertically and -0.7 and -0.9 horizontally. One problem that arises from this method is that since we are averaging the data, we are simplifying the analysis at the cost of losing information about the distribution of second pitches. Therefore, we can take a different approach to try to preserve that information. To do so, at a grid location, we can calculate several average vectors in different directions, instead of one, which will keep more of the original information from the data. This can be accomplished by dividing the area around a given square radially into eight slices and calculating the average in each octant. Here, u and v are vectors, and w is a weight for setting the importance of matching the vector magnitudes (left) and the vector directions (right). For the calculations to follow, we take w = 0.5. The term multiplied to w on the left is an exponential function where the argument is the negative of the absolute value of the difference in the vector magnitudes. Note that when ||u|| = ||v||, the term on the left reduces to w. As the magnitudes diverge, the term tends toward zero. The term multiplied to (1-w) is an exponential function with argument negative quantity 1 minus the dot product between u and v, divided by their magnitudes. When u and v have the same direction, <u,v>/||u|| ||v|| = 1, and the exponent as a whole is zero. When u and v are anti-parallel, <u,v>/||u|| ||v|| = -1 and the exponent is -2 so the term on (1-w) is exp(-2) which is approximately 0.135, which is close to zero. So when u = v, M(u,v) = 1 and when u and v are dissimilar in magnitude and/or direction, M(u,v) is closer to zero. The vectors are spread out in terms of direction, but one vector which extends outside the lower-left quadrant of the plot leads to the cubic spline (light blue curve) bulging to the lower left of the strike zone. Otherwise, the cubic spline has some ebb and flow, but is of similar average distance all around. When we remove the vectors and replace them with the average vector of each octant (red vectors), we have a better idea of where the next pitch might be headed. We also color-code the spline to keep the data about the frequency of the pitches in each octant. Red indicates areas where the most pitches were subsequently thrown and blue the least. We see that the vectors are longer to the left and, based on the heat map on the spline, more frequent. However, a few short or long vectors in areas that are otherwise data-deficient will greatly impact the results. Therefore, we will add to our sample by finding pitchers with similar data in the square. 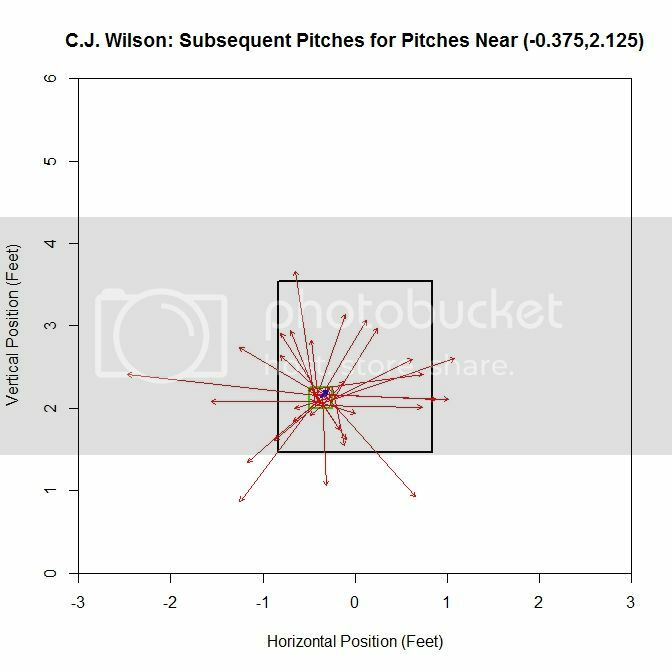 We will compute the value of M between Wilson at that square and the top 200 pitchers in terms of most pitches thrown for the same season. 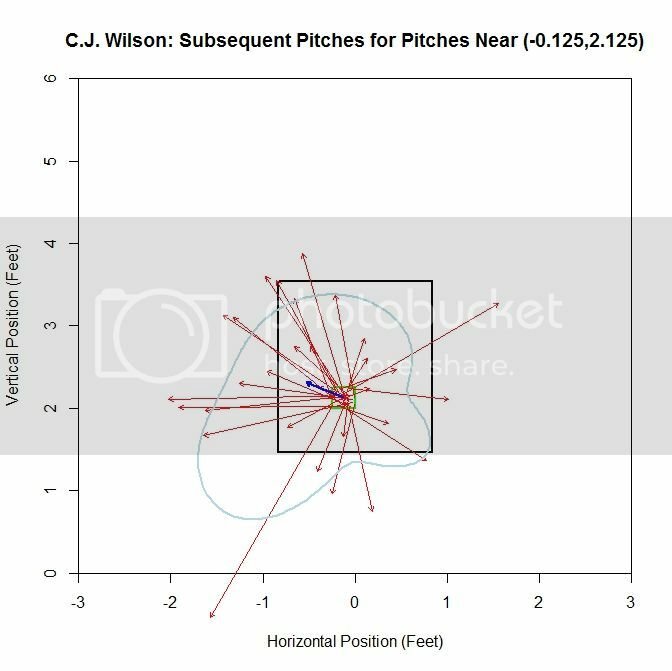 For Wilson, the top five comparable pitchers in the square (-0.125,2.125), with the value of M in parentheses, are Liam Hendriks (0.995), Chris Young (0.986), A.J. Griffin (0.947), Kyle Kendrick (0.943), and Jonathan Sanchez (0.923). Recall that this considers both average vector length and direction. Adding this data to the sample increases its size to 94 pitches. Examining this plot, most of the average vectors are in the range of 1-1.5 feet. The shape of the interpolation is square-like and seems to align near the edge of the strike zone, extending outside the zone, down and to the left. We can also run this at points nearer to the edge of the strike zone. On the left side of the strike zone, we can work off of the square centered at (-0.875,2.375) (note that we drop the plots of the original data in lieu of the plots for the octants). For the original sample, the dominant direction (where most of the vectors are pointed, indicated by the red part of the spline) is to the right, with an average distance of one to two feet in all directions. Now we will add in data based on the average vectors, increasing our sample from 15 to 97 pitches. For the larger sample, the spline, which is almost circular, has average vectors approximately 1 to 1.5 feet in length. The preferred directions are to the right (into the strike zone) and downward (below the left edge of the strike zone). Also note that comparing the two plots, the vectors in the areas where there are the most pitches in the original sample (between three and six o’clock) have average vectors that retain a similar length and direction. Switching sides of the strike zone, we can examine the data related the square centered at (0.875,2.375). For the original sample, the dominant direction is to the left with little to no data oriented to the right. Since there are octants that contain no data, we get a pinched area of the cubic spline. This is due to the choice of how to handle the empty octants. We choose to set the average distance to zero and the direction to the mean direction of the octant. This choice leads to pinching of the curve or cusps in these areas. Another choice would be to remove this octant from the sample and do the interpolation with the remaining nonempty octants. Adding data to this sample increases it from 9 pitches to 67, and the average vector and spline jut out on the right side due to a handful of pitches oriented further in this direction (this is evident from the blue color of the spline). In the areas where most of the subsequent pitches are located, the spline sits near the left edge of the strike zone. Again, the average vectors in the red area of the spline maintain a similar length and direction. Moving to the top of the strike zone, we choose the square centered at (0.125,3.375). The original plot for a square along the top contains 11 pitches and no second pitches are oriented upward. There are only have four non-zero vectors for the spline and the dominant direction is down and to the left. In this square, the sample changes from 11 to 72 pitches by adding similar data. Note the cusp that occurs at the top since we are missing an average vector there. 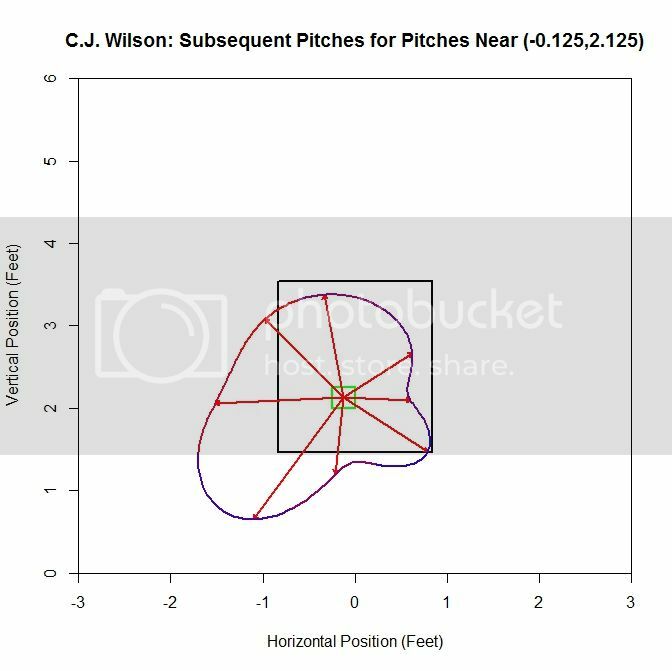 Unsurprisingly, at the top of the strike zone, the preferred direction for the subsequent pitch is downward, and as we rotate away from this direction, the number of pitches in each octant drops. Finally, along the bottom of the strike zone, we choose (0.125,1.625). 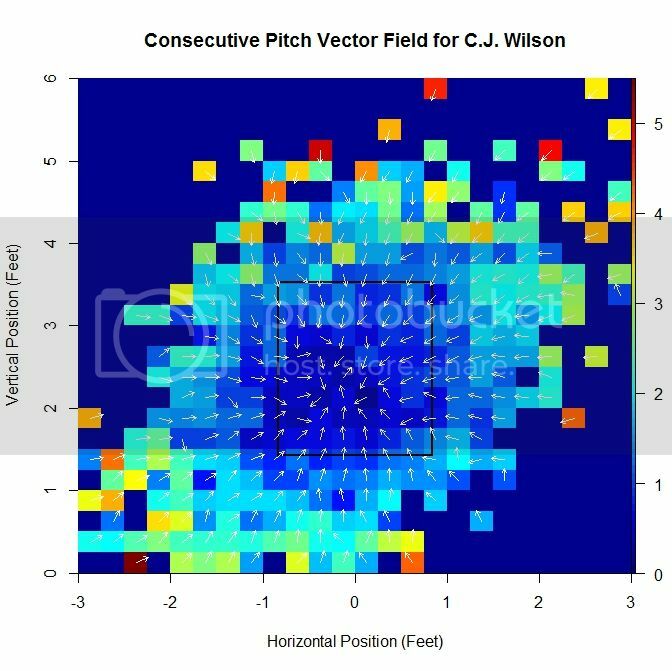 Starting with 27 pitches produces five average vectors, with the dominant direction being up and to the left. With the additional data from other pitchers, the number of pitches moves up to 87. The direction with the most subsequent pitches is up and to the left. In areas where we have the most data in the original sample (the red spline areas), the average vectors and splines are most alike. There are several obvious drawbacks to this method. For the model fitting, we have some points in the strike zone with 30+ pitches and as we move away from the strike zone, we have less and less data for computing the averages. However, as we move away, the general behavior becomes more predictable: the next pitch will likely be closer to the strike zone. So the small sample should have less of a negative effect for points far away. This is also a potential problem since we use these, in some cases, small samples to calculate the average vector in each square, which is used as a reference point for adding data to the sample. It may be better to use the vector from the gradient field for comparison since it relies on all of the available data to compute the average vector (provided the gradient field approach is a decent model). Another problem is that in computing the average vector, we are not taking into account the distribution of the vectors. The same average vector can be formed from many different combination of vectors. However, based on the limited data presented above, adding to the sample, using M and the average vectors, does not seem to have a large effect on octants where there is the most data in the original sample. These regions, even with more data, tend to retain their shape. These are also the areas that are going to contribute most to the average vector that is used for comparison, so this seems like a reasonable result. A smaller problem that shows up near the edge of the zone is that we still occasionally, even after adding more data, get directions with only one or two pieces of data and this causes some of the aberrant behavior seen in some of the plots, characterized by bulges in blue areas of the spline. One solution to this would be to only compute the average vector in that octant if there were more than some fixed number of pitches in that direction. Otherwise, we could set the average vector to zero and the direction to the mean direction in that octant. Obviously, an analysis of one pitcher over a small collection of squares in the grid does not a theory make. It is possible to examine more pitchers, but because the analysis must be done visually, it will be slow and imprecise. Based on these limited results, there may be potential if the process can be condensed. 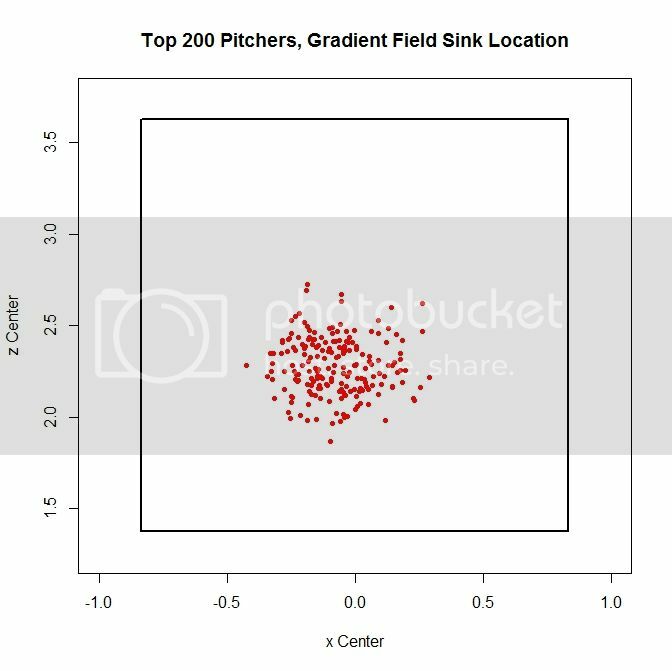 The pitching sink approach gives an idea of where the next pitch may be headed. As we move toward the sink, we have less information on where the next pitch is headed since near this point, the directions will be somewhat evenly distributed. As we move toward the edge of the strike zone, we get a clearer picture of where the next pitch is headed if only for the reason that it seems unlikely that the next pitch will be even further away. While this model seems reasonable in this case, there may be cases where a more general model is needed to fit with the behavior of the data. To recover more accurate information on the location of the next pitch, we can switch to the octant method. Since some areas with this method will have very small samples, we can pad out the data via comparison of the average vectors. This seems to do well at filling out the depleted octants and retains many of the features of the average vectors in the most populated octants of the original samples. At this point, both these models exist as novelties, but hopefully with a little more work and analysis, they can be improved and simplified. 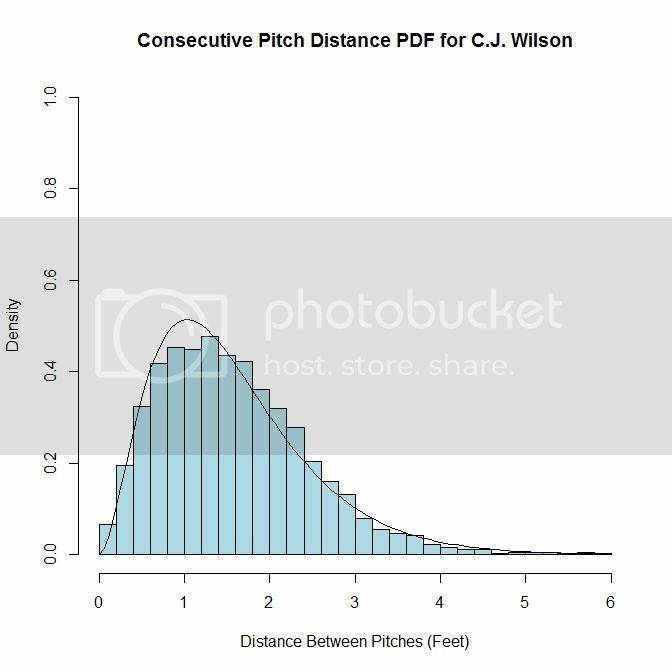 For PITCHf/x data, the starting point for pitches, in terms of the location, velocity, and acceleration, is set at 50 feet from the back of home plate. This is effectively the time-zero location of each pitch. However, 55 feet seems to be the consensus for setting an actual release point distance from home plate, and is used for all pitchers. While this is a reasonable estimate to handle the PITCHf/x data en masse, it would be interesting to see if we can calculate this on the level of individual pitchers, since their release point distances will probably vary based on a number of parameters (height, stride, throwing motion, etc.). 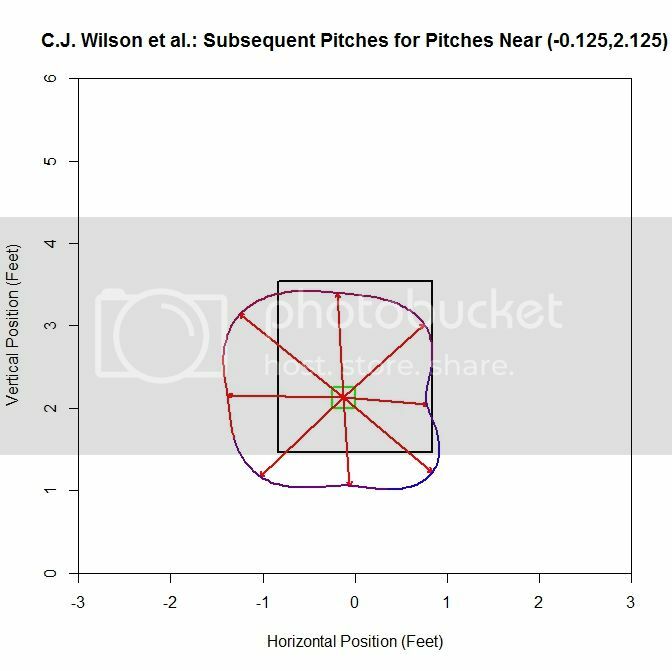 The goal here is to try to use PITCHf/x data to estimate the average distance from home plate the each pitcher releases his pitches, conceding that each pitch is going to be released from a slightly different distance. Since we are operating in the blind, we have to first define what it means to find a pitcher’s release point distance based solely on PITCHf/x data. This definition will set the course by which we will go about calculating the release point distance mathematically. 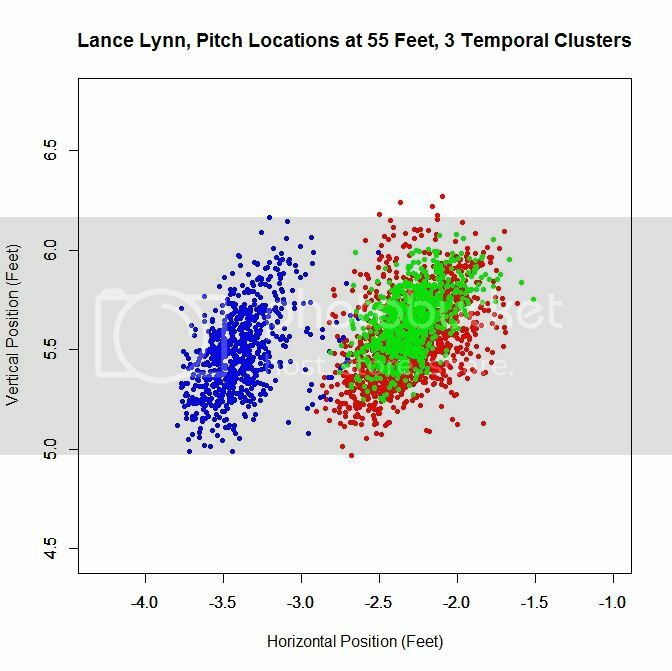 We will define the release point distance as the y-location (the direction from home plate to the pitching mound) at which the pitches from a specific pitcher are “closest together”. This definition makes sense as we would expect the point of origin to be the location where the pitches are closer together than any future point in their trajectory. It also gives us a way to look for this point: treat the pitch locations at a specified distance as a cluster and find the distance at which they are closest. In order to do this, we will make a few assumptions. First, we will assume that the pitches near the release point are from a single bivariate normal (or two-dimensional Gaussian) distribution, from which we can compute a sample mean and covariance. This assumption seems reasonable for most pitchers, but for others we will have to do a little more work. Next we need to define a metric for measuring this idea of closeness. The previous assumption gives us a possible way to do this: compute the ellipse, based on the data at a fixed distance from home plate, that accounts for two standard deviations in each direction along the principal axes for the cluster. This is a way to provide a two-dimensional figure which encloses most of the data, of which we can calculate an associated area. The one-dimensional analogue to this is finding the distance between two standard deviations of a univariate normal distribution. Such a calculation in two dimensions amounts to finding the sample covariance, which, for this problem, will be a 2×2 matrix, finding its eigenvalues and eigenvectors, and using this to find the area of the ellipse. Here, each eigenvector defines a principal axis and its corresponding eigenvalue the variance along that axis (taking the square root of each eigenvalue gives the standard deviation along that axis). The formula for the area of an ellipse is Area = pi*a*b, where a is half of the length of the major axis and b half of the length of the minor axis. The area of the ellipse we are interested in is four times pi times the square root of each eigenvalue. Note that since we want to find the distance corresponding to the minimum area, the choice of two standard deviations, in lieu of one or three, is irrelevant since this plays the role of a scale factor and will not affect the location of the minimum, only the value of the functional. With this definition of closeness in order, we can now set up the algorithm. To be safe, we will take a large berth around y=55 to calculate the ellipses. Based on trial and error, y=45 to y=65 seems more than sufficient. Starting at one end, say y=45, we use the PITCHf/x location, velocity, and acceleration data to calculate the x (horizontal) and z (vertical) position of each pitch at 45 feet. We can then compute the sample covariance and then the area of the ellipse. Working in increments, say one inch, we can work toward y=65. This will produce a discrete function with a minimum value. We can then find where the minimum occurs (choosing the smallest value in a finite set) and thus the estimate of the release point distance for the pitcher. Earlier we assumed that the data at a fixed y-location was from a bivariate normal distribution. While this is a reasonable assumption, one can still run into difficulties with noisy/inaccurate data or multiple clusters. This can be for myriad reasons: in-season change in pitching mechanics, change in location on the pitching rubber, etc. Since data sets with these factors present will still produce results via the outlined algorithm despite violating our assumptions, the results may be spurious. To handle this, we will fit the data to a Gaussian mixture model via an incremental k-means algorithm at 55 feet. This will approximate the distribution of the data with a probability density function (pdf) that is the sum of k bivariate normal distributions, referred to as components, weighted by their contribution to the pdf, where the weights sum to unity. The number of components, k, is determined by the algorithm based on the distribution of the data. With the mixture model in hand, we then are faced with how to assign each data point to a cluster. This is not so much a problem as a choice and there are a few reasonable ways to do it. In the process of determining the pdf, each data point is assigned a conditional probability that it belongs to each component. Based on these probabilities, we can assign each data point to a component, thus forming clusters (from here on, we will use the term “cluster” generically to refer to the number of components in the pdf as well as the groupings of data to simplify the terminology). The easiest way to assign the data would be to associate each point with the cluster that it has the highest probability of belonging to. We could then take the largest cluster and perform the analysis on it. However, this becomes troublesome for cases like overlapping clusters. A better assumption would be that there is one dominant cluster and to treat the rest as “noise”. Then we would keep only the points that have at least a fixed probability or better of belonging to the dominant cluster, say five percent. This will throw away less data and fits better with the previous assumption of a single bivariate normal cluster. Both of these methods will also handle the problem of having disjoint clusters by choosing only the one with the most data. In demonstrating the algorithm, we will try these two methods for sorting the data as well as including all data, bivariate normal or not. We will also explore a temporal sorting of the data, as this may do a better job than spatial clustering and is much cheaper to perform. To demonstrate this algorithm, we will choose three pitchers with unique data sets from the 2012 season and see how it performs on them: Clayton Kershaw, Lance Lynn, and Cole Hamels. At 55 feet, the Gaussian mixture model identifies five clusters for Kershaw’s data. The green stars represent the center of each cluster and the red ellipses indicate two standard deviations from center along the principal axes. The largest cluster in this group has a weight of .64, meaning it accounts for 64% of the mixture model’s distribution. This is the cluster around the point (1.56,6.44). We will work off of this cluster and remove the data that has a low probability of coming from it. This is will include dispensing with the sparse cluster to the upper-right and some data on the periphery of the main cluster. 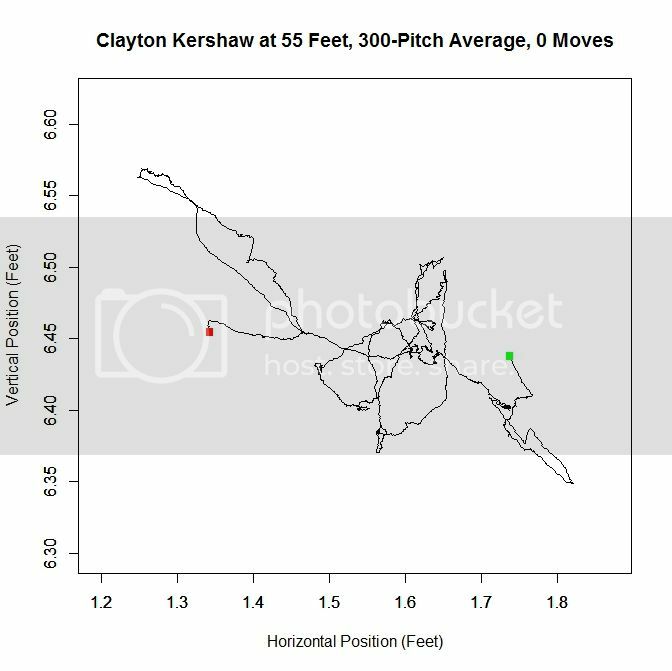 We can see how Kershaw’s clusters are generated by taking a rolling average of his pitch locations at 55 feet (the standard distance used for release points) over the course of 300 pitches (about three starts). The green square indicates the average of the first 300 pitches and the red the last 300. 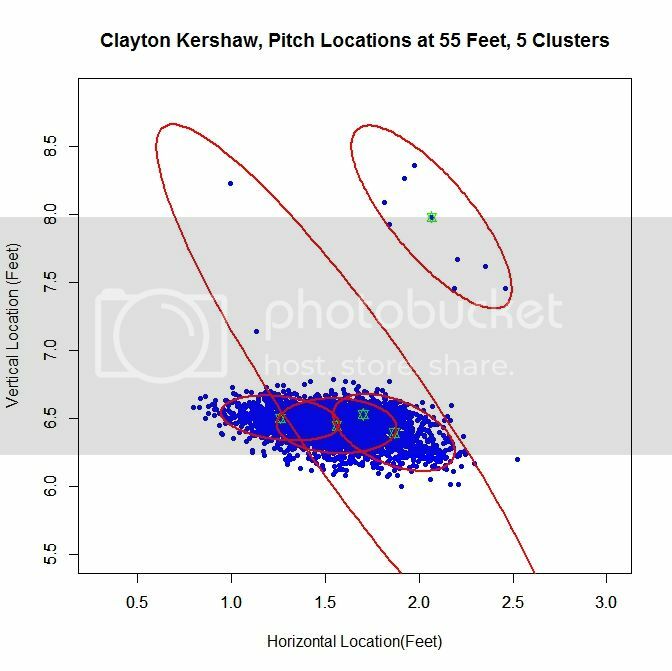 From the plot, we can see that Kershaw’s data at 55 feet has very little variation in the vertical direction but, over the course of the season, drifts about 0.4 feet with a large part of the rolling average living between 1.5 and 1.6 feet (measured from the center of home plate). For future reference, we will define a “move” of release point as a 9-inch change in consecutive, disjoint 300-pitch averages (this is the “0 Moves” that shows up in the title of the plot and would have been denoted by a blue square in the plot). The choices of 300 pitches and 9 inches for a move was chosen to provide a large enough sample and enough distance for the clusters to be noticeably disjoint, but one could choose, for example, 100 pitches and 6 inches or any other reasonable values. 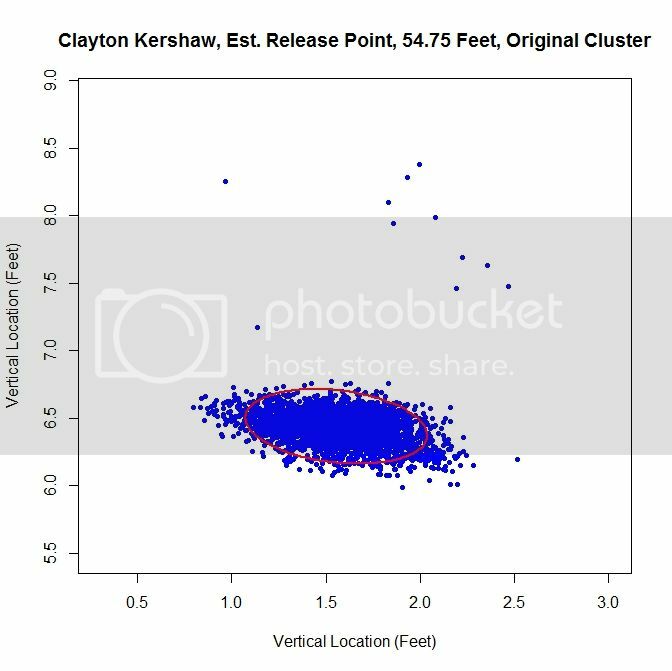 So, we can conclude that Kershaw never made a significant change in his release point during 2012 and therefore treating the data a single cluster is justifiable. From the spatial clustering results, the first way we will clean up the data set is to take only the data which is most likely from the dominant cluster (based on the conditional probabilities from the clustering algorithm). We can then take this data and approximate the release point distance via the previously discussed algorithm. The release point for this set is estimated at 54 feet, 5 inches. We can also estimate the arm release angle, the angle a pitcher’s arm would make with a horizontal line when viewed from the catcher’s perspective (0 degrees would be a sidearm delivery and would increase as the arm was raised, up to 90 degrees). This can be accomplished by taking the angle of the eigenvector, from horizontal, which corresponds to the smaller variance. This is working under the assumption that a pitcher’s release point will vary more perpendicular to the arm than parallel to the arm. In this case, the arm angle is estimated at 90 degrees. This is likely because we have blunted the edges of the cluster too much, making it closer to circular than the original data. This is because we have the clusters to the left and right of the dominant cluster which are not contributing data. It is obvious that this way of sorting the data has the problem of creating sharp transitions at the edge of cluster. As discussed above, we run the algorithm from 45 to 65 feet, in one-inch increments, and find the location corresponding to the smallest ellipse. We can look at the functional that tracks the area of the ellipses at different distances in the aforementioned case. This area method produces a functional (in our case, it has been discretized to each inch) that can be minimized easily. It is clear from the plot that the minimum occurs at slightly less than 55 feet. Since all of the plots for the functional essentially look parabolic, we will forgo any future plots of this nature. The next method is to assume that the data is all from one cluster and remove any data points that have a lower than five-percent probability of coming from the dominant cluster. This produces slightly better visual results. For this choice, we get trimming away at the edges, but it is not as extreme as in the previous case. The release point is at 54 feet, 3 inches, which is very close to our previous estimate. The arm angle is more realistic, since we maintain the elliptical shape of the data, at 82 degrees. Finally, we will run the algorithm with the data as-is. We get an ellipse that fits the original data well and indicates a release point of 54 feet, 9 inches. The arm angle, for the original data set, is 79 degrees. Examining the results, the original data set may be the one of choice for running the algorithm. The shape of the data is already elliptic and, for all intents and purposes, one cluster. However, one may still want to remove manually the handful of outliers before preforming the estimation. 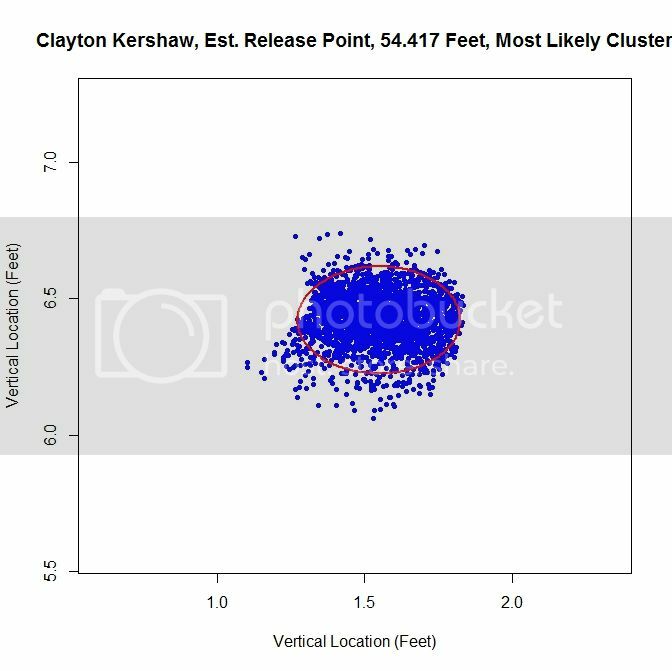 Clayton Kershaw’s data set is much cleaner than most, consisting of a single cluster and a few outliers. 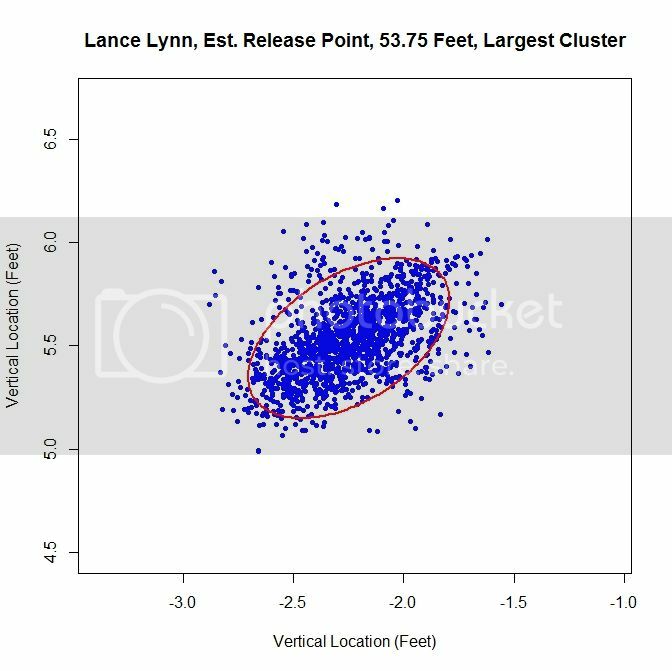 Lance Lynn’s data has a different structure. The algorithm produces three clusters, two of which share some overlap and the third disjoint from the others. Immediately, it is obvious that running the algorithm on the original data will not produce good results because we do not have a single cluster like with Kershaw. One of our other choices will likely do better. Looking at the rolling average of release points, we can get an idea of what is going on with the data set. 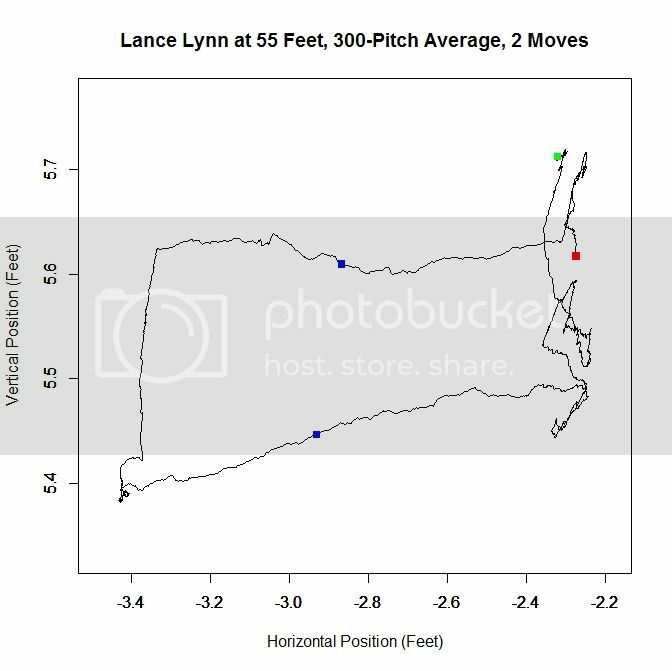 From the rolling average, we see that Lynn’s release point started around -2.3 feet, jumped to -3.4 feet and moved back to -2.3 feet. The moves discussed in the Kershaw section of 9 inches over consecutive, disjoint 300-pitch sequences are indicated by the two blue squares. 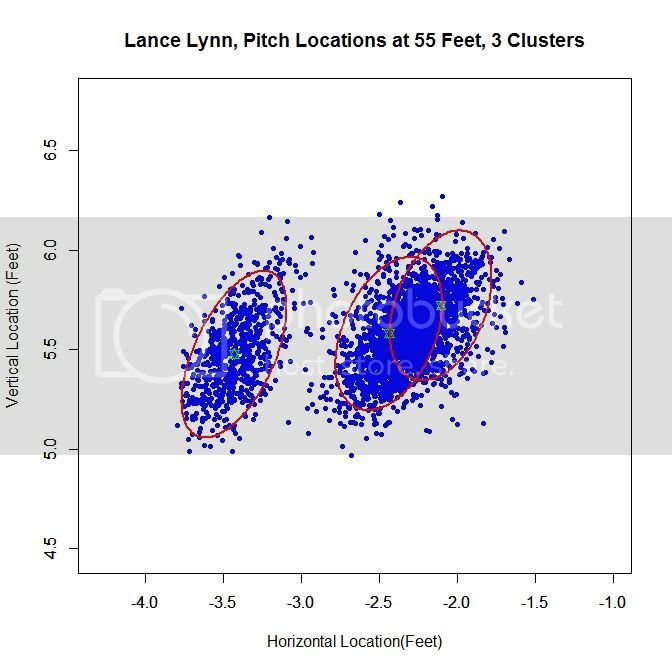 So around Pitch #1518, Lynn moved about a foot to the left (from the catcher’s perspective) and later moved back, around Pitch #2239. So it makes sense that Lynn might have three clusters since there were two moves. However his first and third clusters could be considered the same since they are very similar in spatial location. Since we have two clusters that overlap, this method sharply cuts the data on the right hand side. The release point is at 54 feet, 4 inches and the release angle is 33 degrees. For the five-percent method, the cluster will be better shaped since the transition between clusters will not be so sharp. This produces a well-shaped single cluster which is free of all of the data on the left and some of the data from the far right cluster. The release point is at 53 feet, 11 inches and at an angle of 49 degrees. 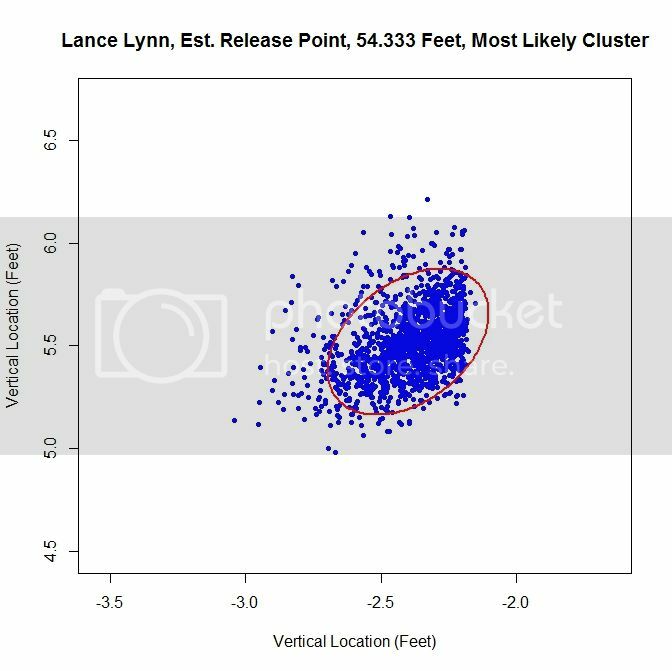 As opposed to Kershaw, who had a single cluster, Lynn has at least two clusters. Therefore, running this method on the original data set probably will not fare well. Having more than one cluster and analyzing it as only one causes both a problem with the release point and release angle. Since the data has disjoint clusters, it violates our bivariate normal assumption. Also, the angle will likely be incorrect since the ellipse will not properly fit the data (in this instance, it is 82 degrees). Note that the release point distance is not in line with the estimates from the other two methods, being 51 feet, 5 inches instead of around 54 feet. 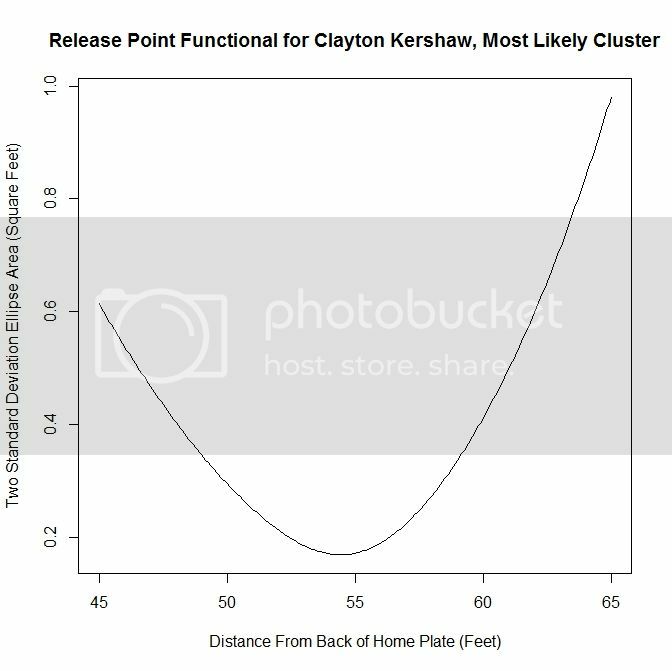 In this case, as opposed to Kershaw, who only had one pitch cluster, we can temporally sort the data based on the rolling average at the blue square (where the largest difference between the consecutive rolling averages is located). The distance from home plate of 53 feet, 9 inches matches our other estimates of about 54 feet. The angle in this case is 55 degrees, which is also in agreement. To finish our case study, we will look at another data set that has more than one cluster. 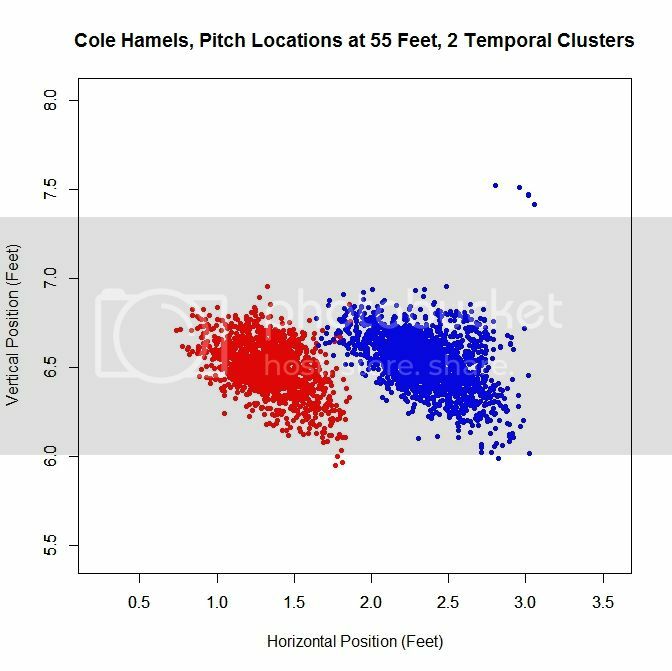 For Cole Hamels, we get two dense clusters and two sparse clusters. The two dense clusters appear to have a similar shape and one is shifted a little over a foot away from the other. The middle of the three consecutive clusters only accounts for 14% of the distribution and the long cluster running diagonally through the graph is mostly picking up the handful of outliers, and consists of less than 1% of the distribution. We will work with the the cluster with the largest weight, about 0.48, which is the cluster on the far right. 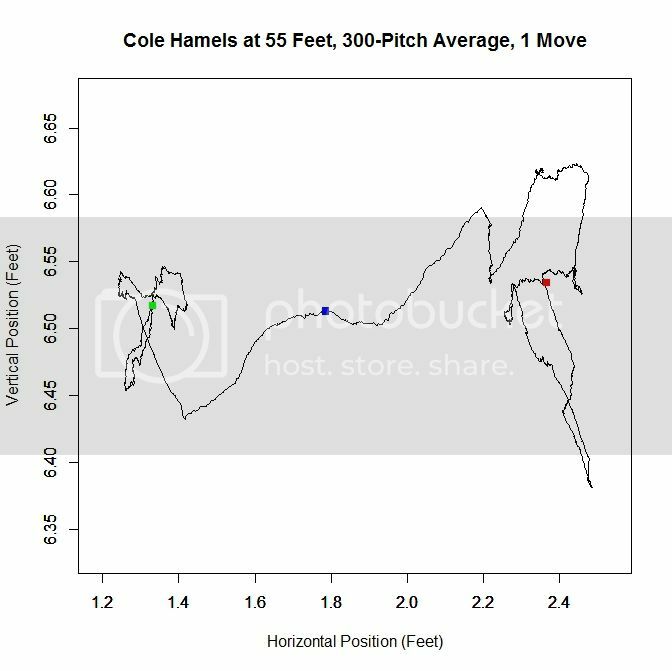 If we look at the rolling average for Hamels’ release point, we can see that he switched his release point somewhere around Pitch #1359 last season. 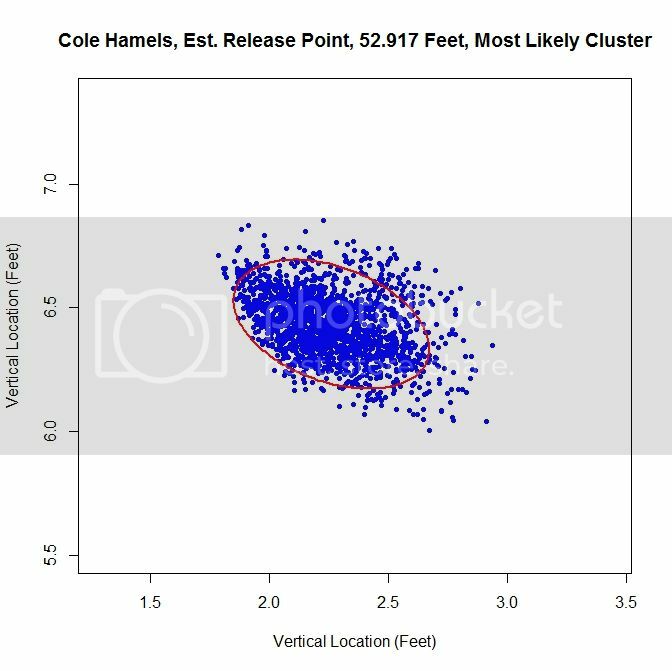 As in the clustered data, Hamel’s release point moves horizontally by just over a foot to the right during the season. As before, we will start by taking only the data which most likely belongs to the cluster on the right. For this method of sorting through the data, we get 52 feet, 10 inches for the release point distance. The cluster has a better shape than the most-likely method and gives a release angle of 74 degrees. So far, both estimates are very close. Using just the original data set, we expect that the method will not perform well because there are two disjoint clusters. 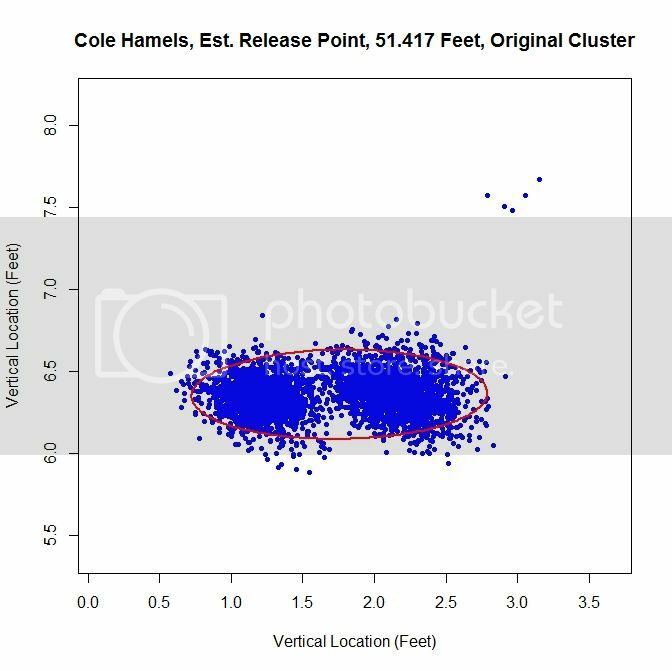 We run into the problem of treating two clusters as one and the angle of release goes to 89 degrees since both clusters are at about the same vertical level and therefore there is a large variation in the data horizontally. Just like with Lance Lynn, we can do a temporal splitting of the data. In this case, we get two clusters since he changed his release point once. 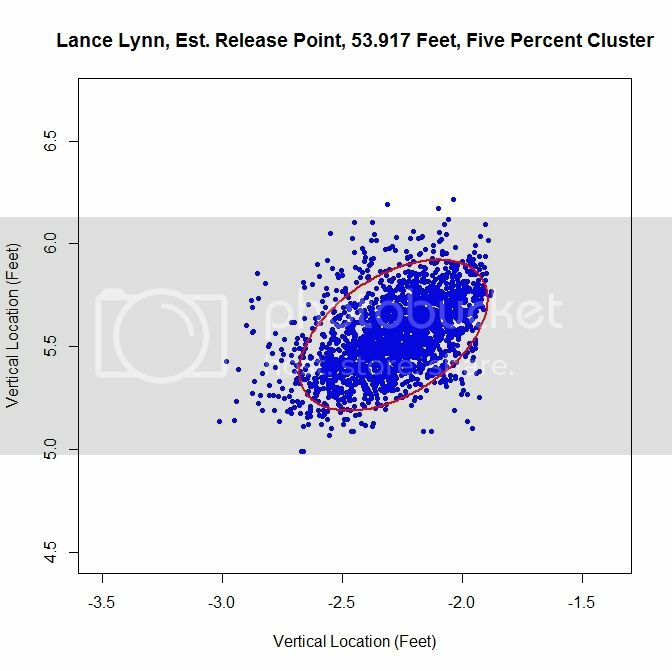 Working with the dominant cluster, the blue data, we obtain a release point at 53 feet, 2 inches and a release angle of 75 degrees. All three methods that sort the data before performing the algorithm lead to similar results. Examining the results of these three cases, we can draw a few conclusions. First, regardless of the accuracy of the method, it does produce results within the realm of possibility. We do not get release point distances that are at the boundary of our search space of 45 to 65 feet, or something that would definitely be incorrect, such as 60 feet. So while these release point distances have some error in them, this algorithm can likely be refined to be more accurate. Another interesting result is that, provided that the data is predominantly one cluster, the results do not change dramatically due to how we remove outliers or smaller additional clusters. In most cases, the change is typically only a few inches. For the release angles, the five-percent method or largest method probably produces the best results because it does not misshape the clusters like the mostly-likely method does and does not run into the problem of multiple clusters that may plague the original data. 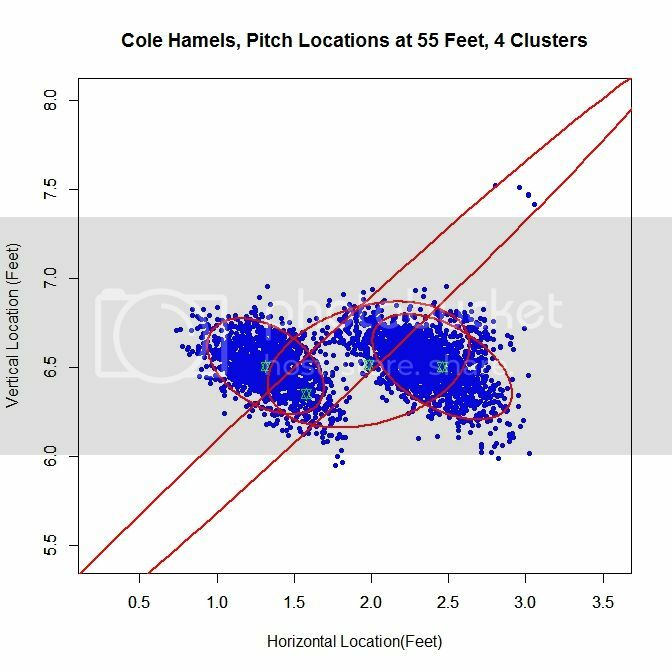 Overall, the five-percent method is probably the best bet for running the algorithm and getting decent results for cases of repeated clusters (Lance Lynn) and the largest method will work best for disjoint clusters (Cole Hamels). 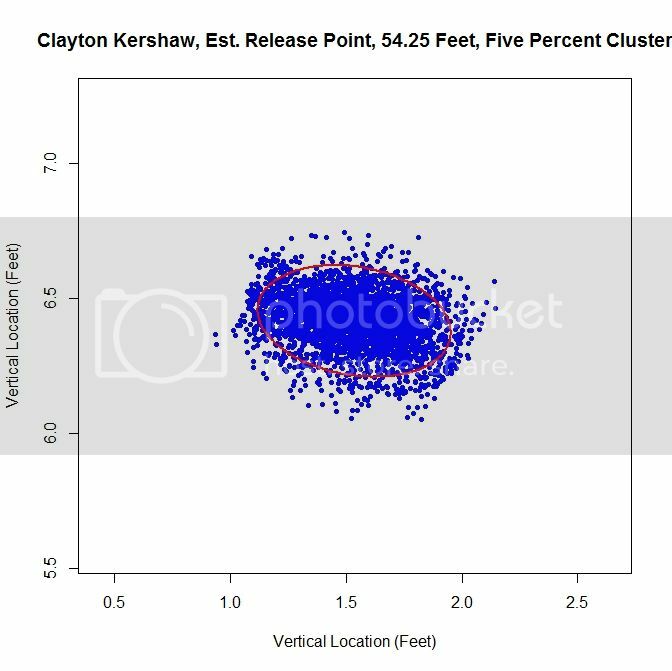 If just one cluster exists, then working with the original data would seem preferable (Clayton Kershaw). Moving forward, the goal is settle on a single method for sorting the data before running the algorithm. The largest method seems the best choice for a robust algorithm since it is inexpensive and, based on limited results, performs on par with the best spatial clustering methods. One problem that comes up in running the simulations that does not show up in the data is the cost of the clustering algorithm. Since the method for finding the clusters is incremental, it can be slow, depending on the number of clusters. One must also iterate to find the covariance matrices and weights for each cluster, which can also be expensive. 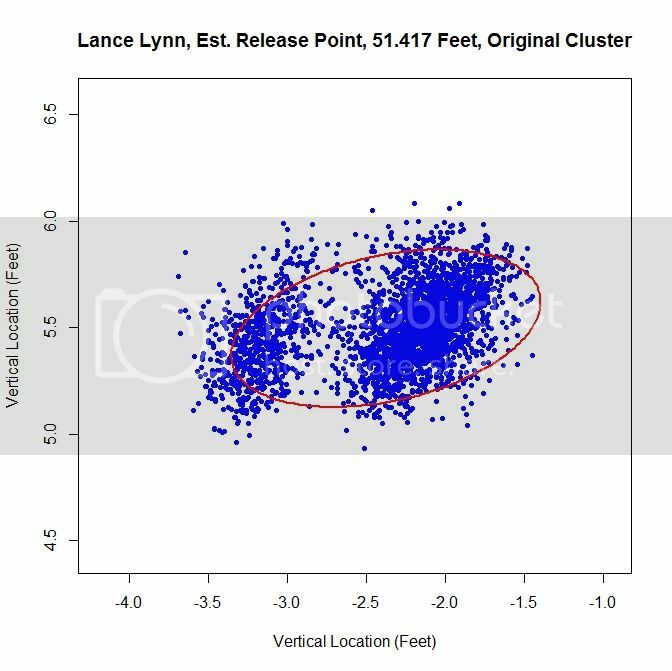 In addition, the spatial clustering only has the advantages of removing outliers and maintaining repeated clusters, as in Lance Lynn’s case. Given the difference in run time, a few seconds for temporal splitting versus a few hours for spatial clustering, it seems a small price to pay. There are also other approaches that can be taken. The data could be broken down by start and sorted that way as well, with some criteria assigned to determine when data from two starts belong to the same cluster. Another problem exists that we may not be able to account for. 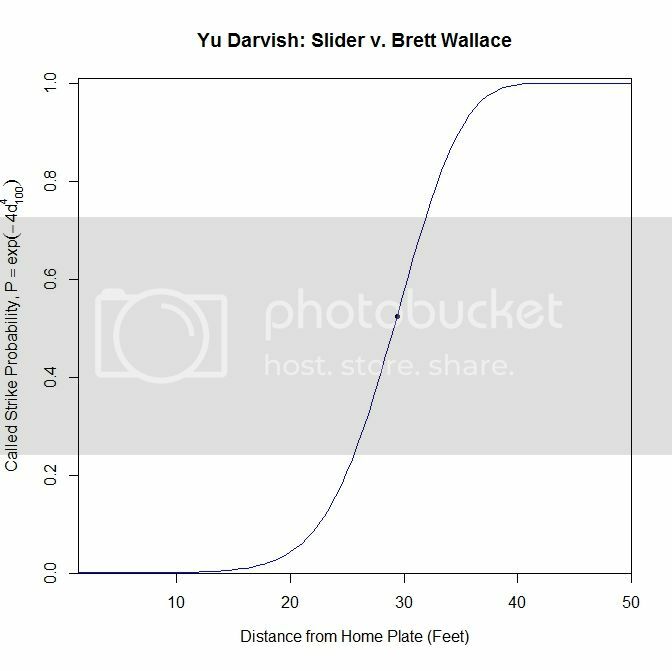 Since the data for the path of a pitch starts at 50 feet and is for tracking the pitch toward home plate, we are essentially extrapolating to get the position of the pitch before (for larger values than) 50 feet. While this may hold for a small distance, we do not know exactly how far this trajectory is correct. The location of the pitch prior to its individual release point, which we may not know, is essentially hypothetical data since the pitch never existed at that distance from home plate. 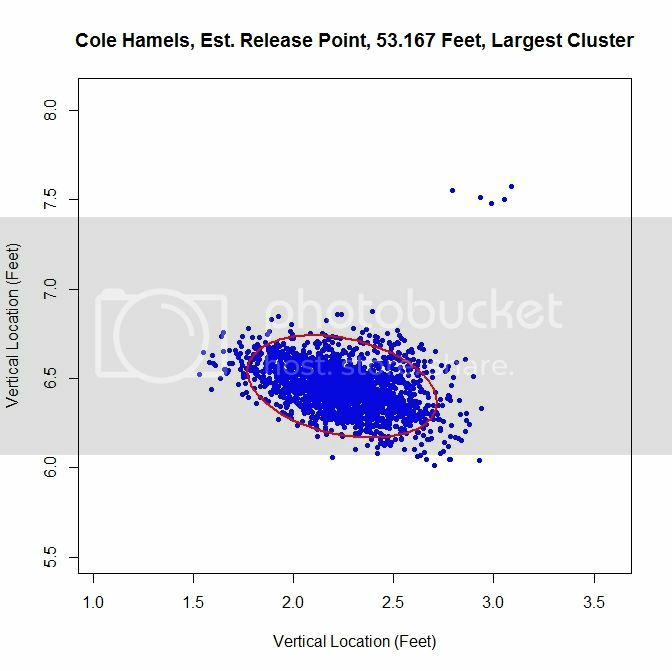 This is why is might be important to get a good estimate of a pitcher’s release point distance. 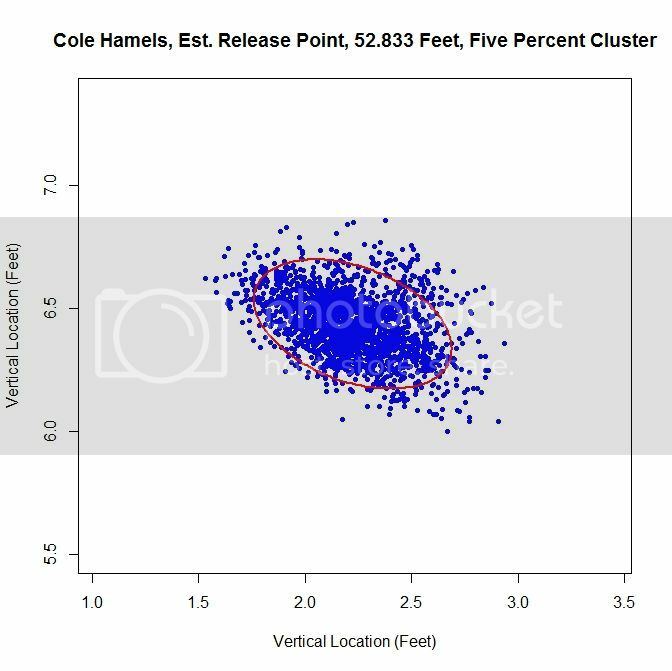 There are certainly many other ways to go about estimating release point distance, such as other ways to judge “closeness” of the pitches or sort the data. By mathematizing the problem, and depending on the implementation choices, we have a means to find a distinct release point distance. This is a first attempt at solving this problem which shows some potential. The goal now is to refine it and make it more robust. Once the algorithm is finalized, it would be interesting to go through video and see how well the results match reality, in terms of release point distance and angle. As it is, we are essentially operating blind since we are using nothing but the PITCHf/x data and some reasonable assumptions. While this worked to produce decent results, it would be best to create a single, robust algorithm that does not require visual inspection of the data for each case. When that is completed, we could then run the algorithm on a large sample of pitchers and compare the results.